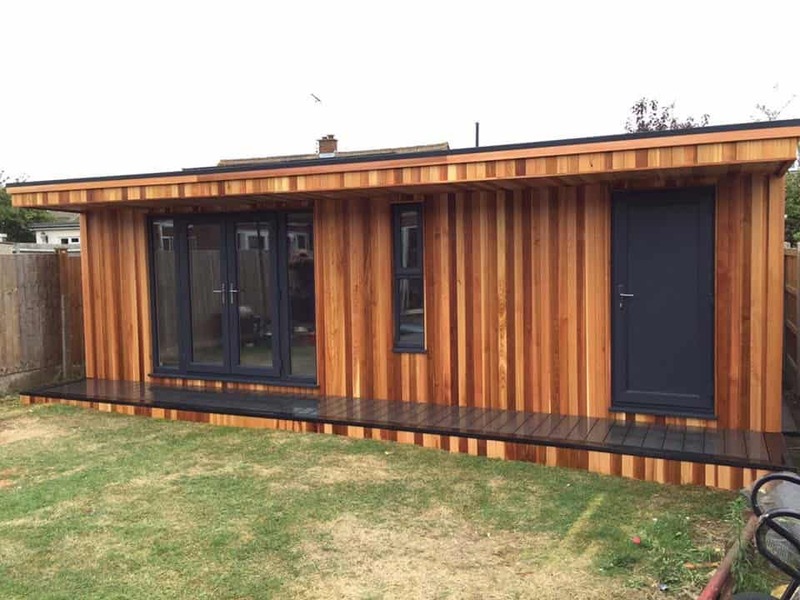 Would you love a home garden office but aren’t sure where you would put it? 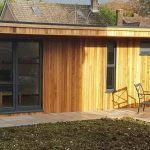 Perhaps you don’t have the room in your garden for a new garden room as well as a shed, but need the storage? 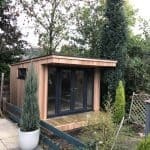 If so, a garden office with extra storage could be just the right kind of build for you! A garden office with integrated shed storage can combine a peaceful place to work outside of the house, with a practical storage space in which to keep everything you usually keep in a shed; the lawn mower, the garden tools and those all important tins of old paint. If you are worried because because you have a small or oddly shaped garden, then you can relax. 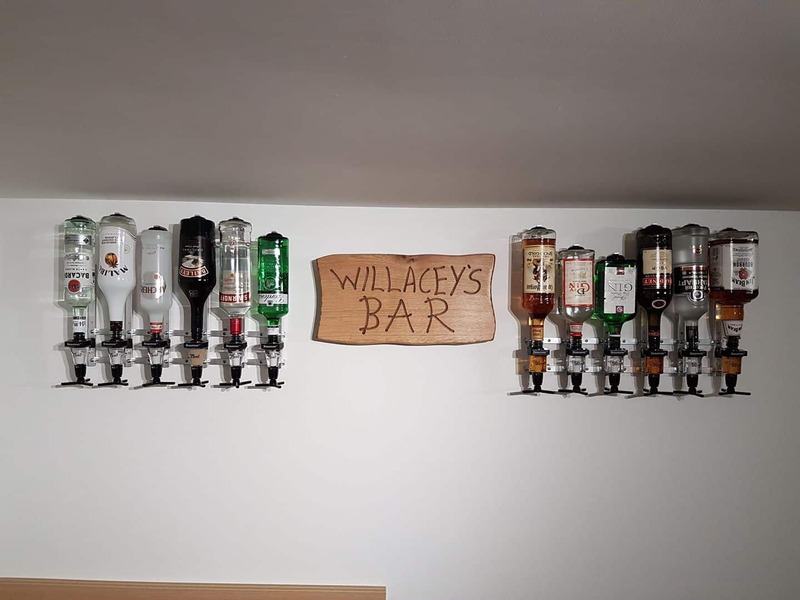 With our bespoke design service, it could still possible to get the extra space that you need. 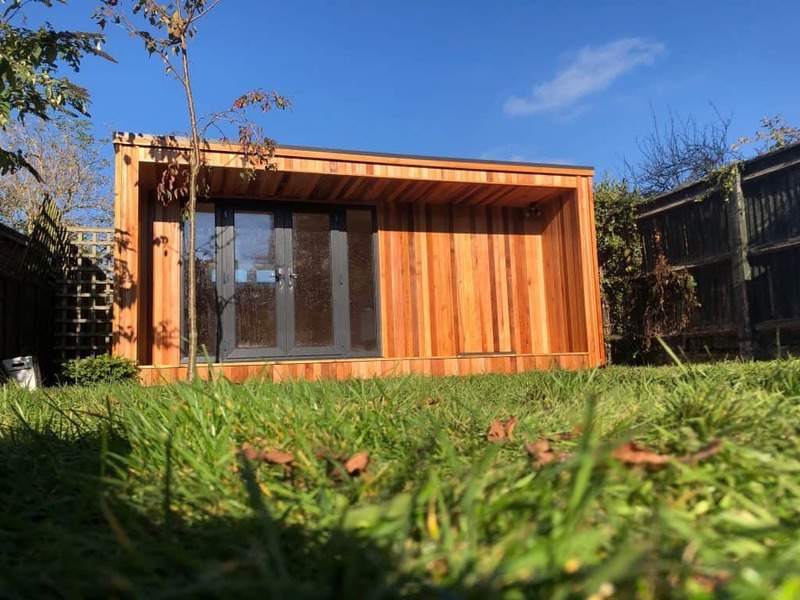 Our client Rob wanted to create a garden office with room for storage, but he had a huge tree slap bang in the middle of his garden which he didn’t want to cut down. 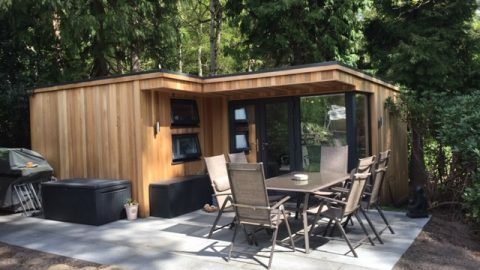 Modern Garden Rooms were able to come up with a solution for a garden office with storage that matched his vision. 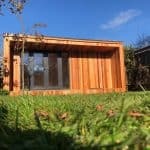 Rob’s bespoke Garden Office with storage measured 7m x 3m in total. 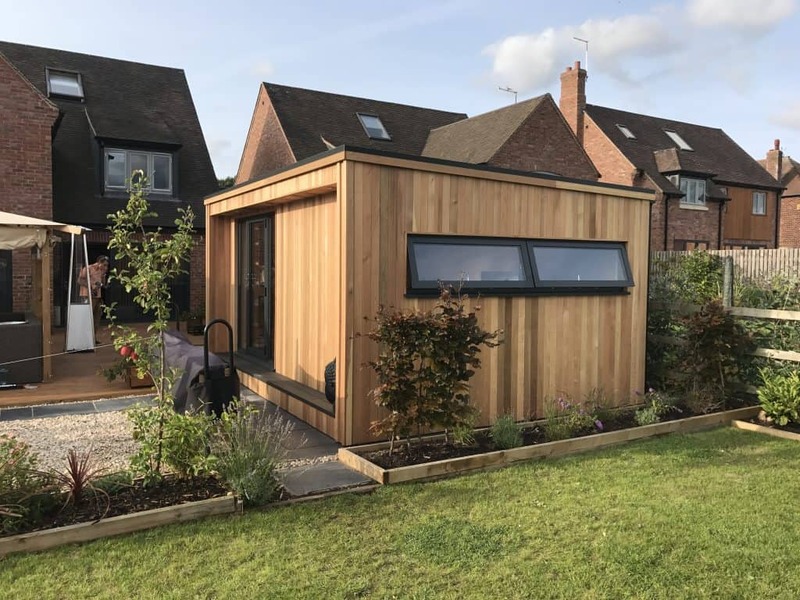 The L-shaped Cube Garden Room comprised two sections, with the larger section being the office and the smaller being an integrated shed with a hidden cedar-clad door. 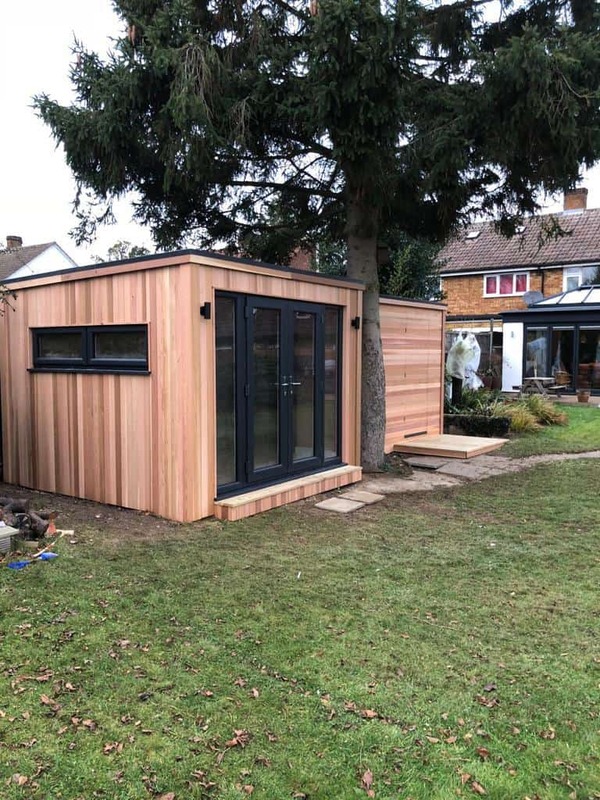 When Rob first contacted us about a new garden office, we knew that the build was going to have some interesting challenges; not least because there was a very large tree right in the middle of the garden which Rob definitely wanted to keep. This meant designing Rob’s new garden office from scratch around the tree! Rob had a very clear idea of how he wanted his new garden office with storage to look, so we worked closely with him to come up with a design which met his vision whilst also being practical and aesthetically pleasing. 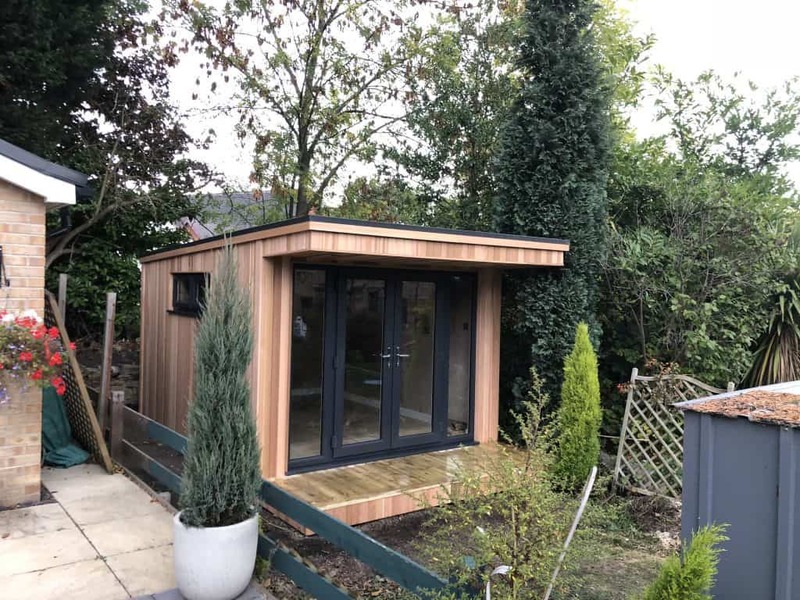 Taking his requirements on board, we suggested that Rob opt for a new garden office with storage, and created a bespoke garden room design based on our ever-popular Cube Garden Room range, with simple lines and plenty of natural light. 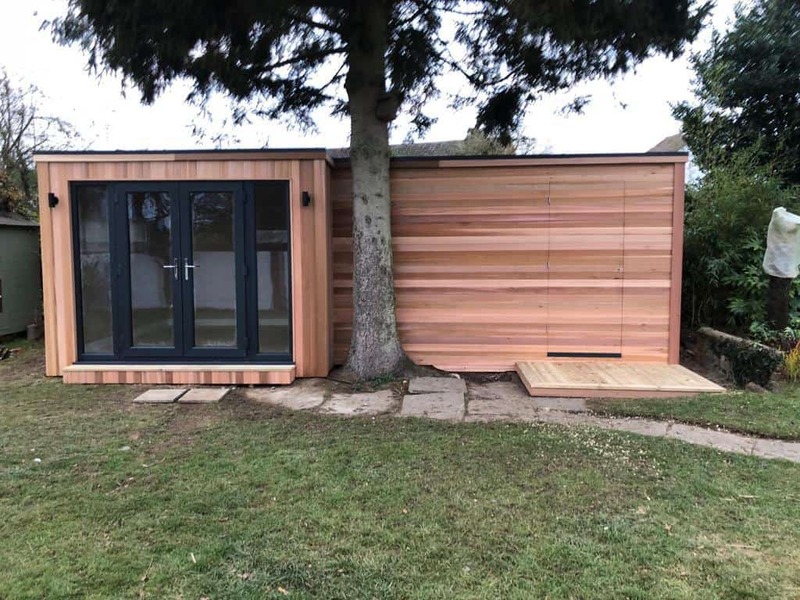 Our design incorporated a new garden office and a shed storage room, using all of the available space around the existing tree which Rob wanted to keep. 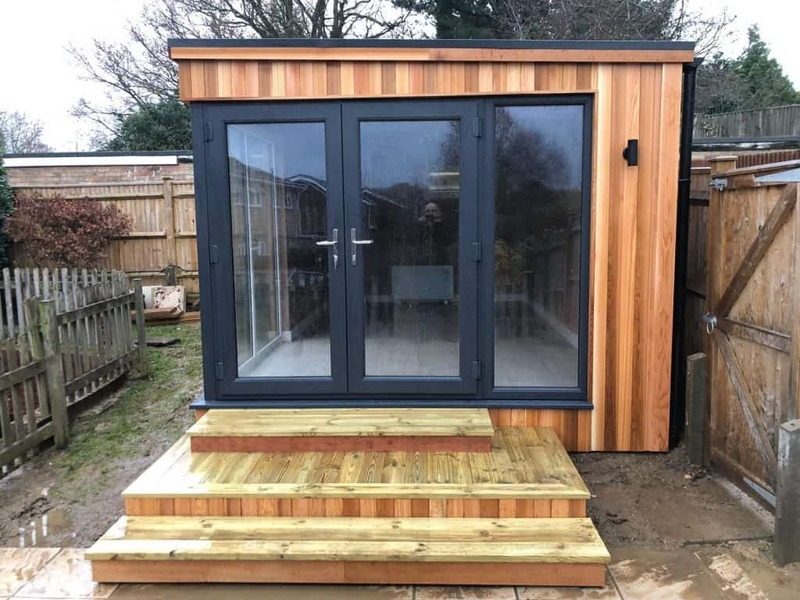 The large double doors to the front and the windows to the side were designed to let as much light as possible into the office area, and the storage compartment and door to the right of the French doors was entirely clad in cedar, hiding it away from view. 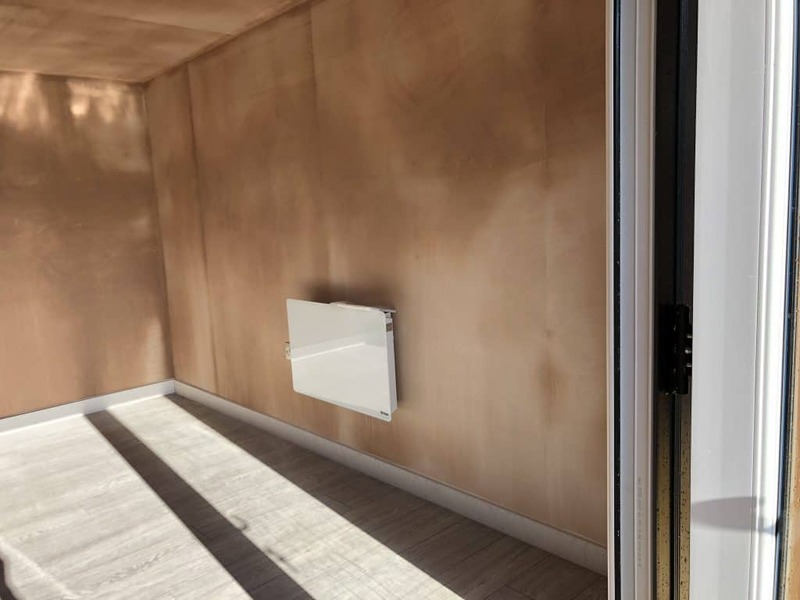 At the last minute it was decided to clad the storage area horizontally, which we think looks fantastic. 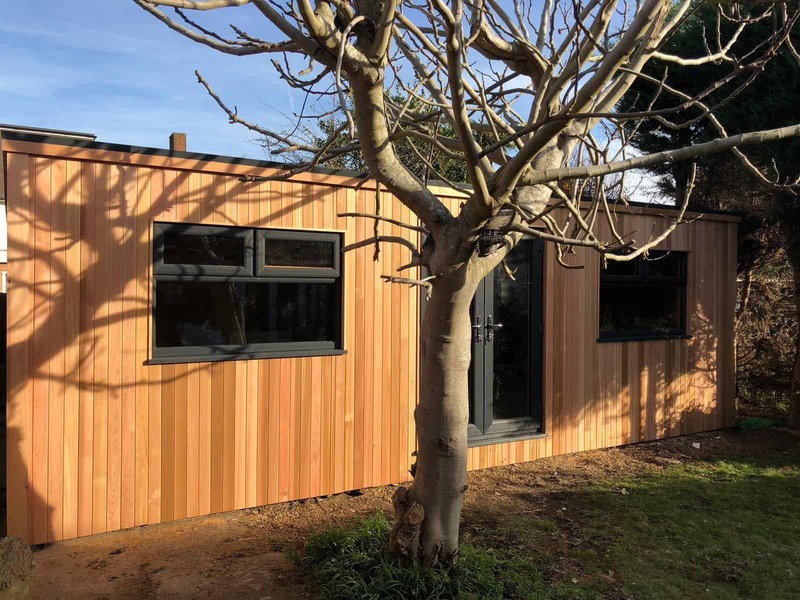 Rob’s new cube garden office with storage fits into his garden perfectly, and as the cedar cladding fades over the years, the building will look like it’s been part of the landscape forever. 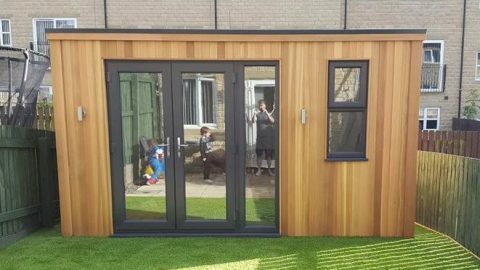 This Garden Games Room is 8m x 5m and is one or our more popular Canopy Rooms. 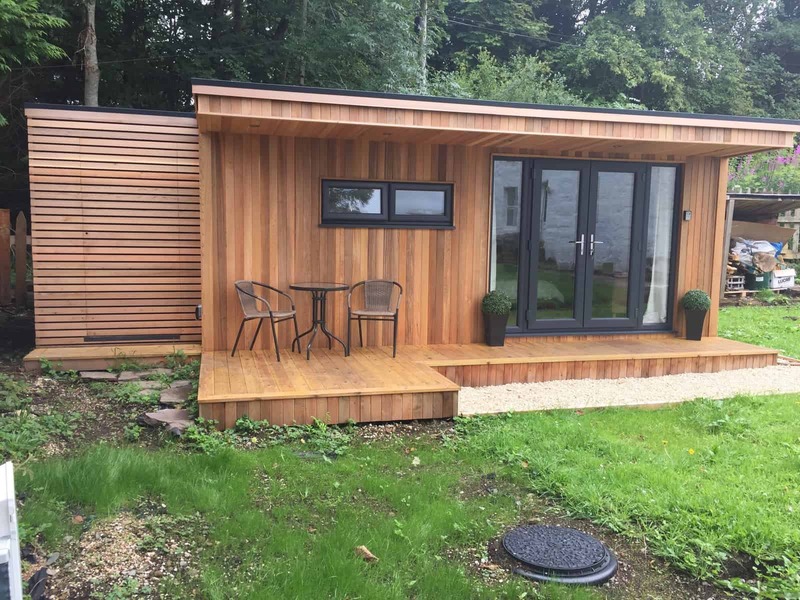 Externally appealing with red western cedar cladding and composite decking. 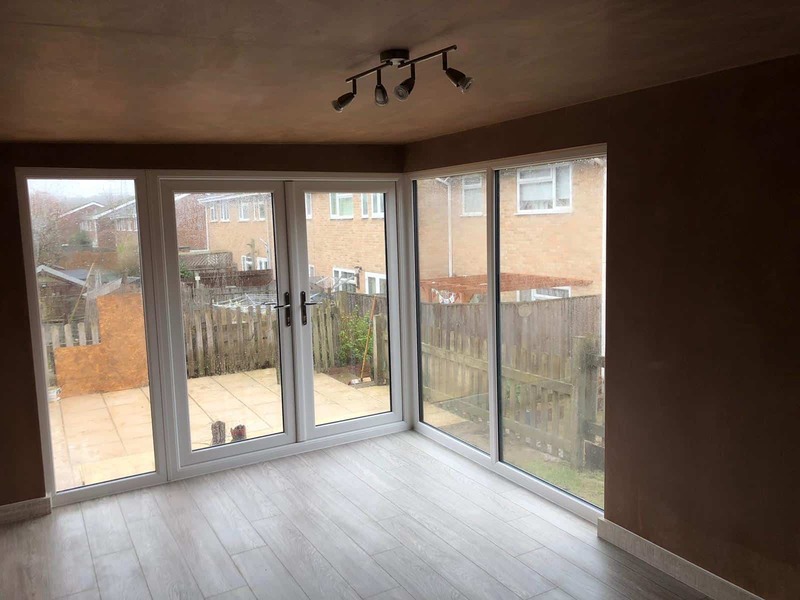 Fitted with anthracite UPVc windows and doors, the French doors are 2.5m wide including the side lights. 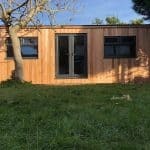 In addition the shed has a 0.9m wide Solid core door. And in the middle of the two doors is a .4m x 1.6m top opener window. Internally divided into 3 separate rooms. There is a shed that is accessible from the outside. 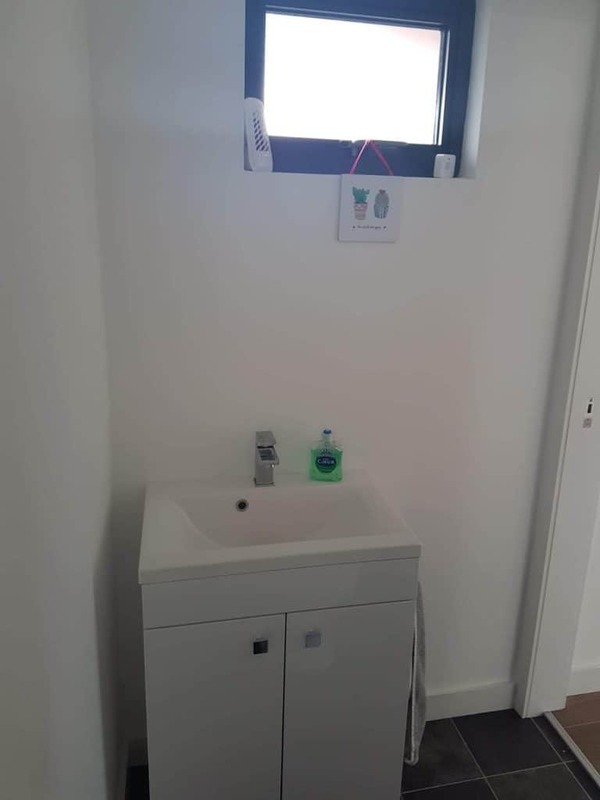 Also a smaller room to the rear with an internal door used as a toilet room. Each room is equipped with light fittings and switches, as well as power sockets. 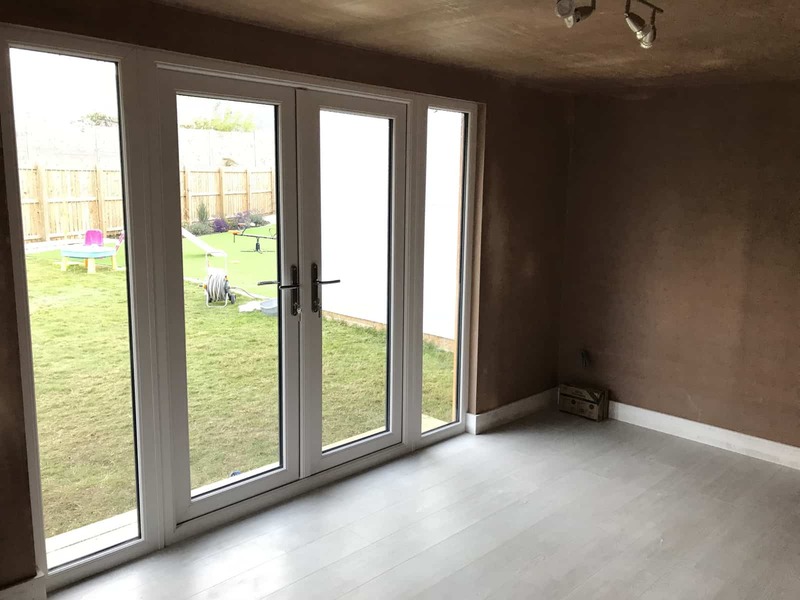 Generally speaking all of our room have a plaster finish to the walls, with laminate flooring and skirting fitted as standard. Sheds are ply or OSB lined. From time to time space in the house can get hard to come by. With going out drinking getting more expensive Kev wanted to use the space in his garden to have his mates round on an evening. He also waned to then let his kids use the space through the day. 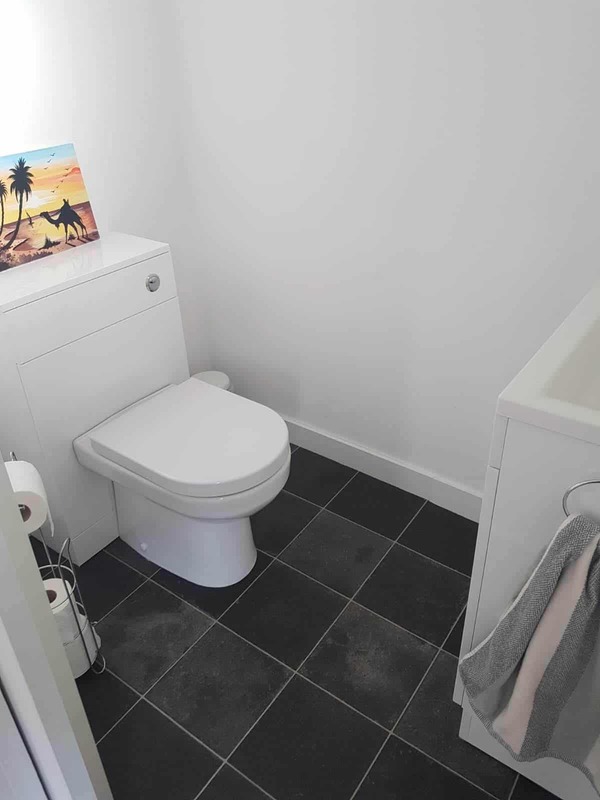 Kev required a small toilet room and more importantly a space large enough to store his fishing equipment. For the most part out buildings fall under Permitted Development. 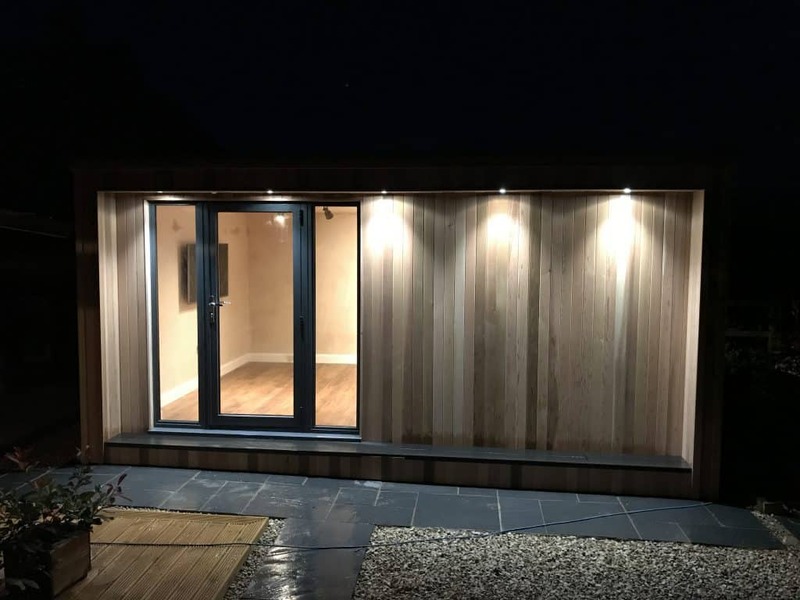 Therefore not need planning permission providing they comply with the requirements outlined on our page about Planning and Building Regulations. 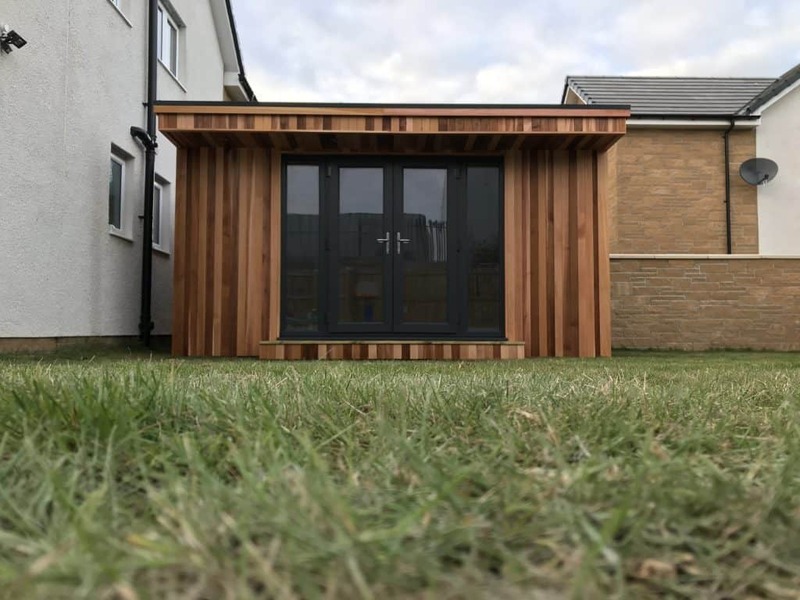 With this in mind we can use our experience and knowledge to design this bespoke garden games room for Kev. We fulfilled all his requirements and visually exceeded his expectations. 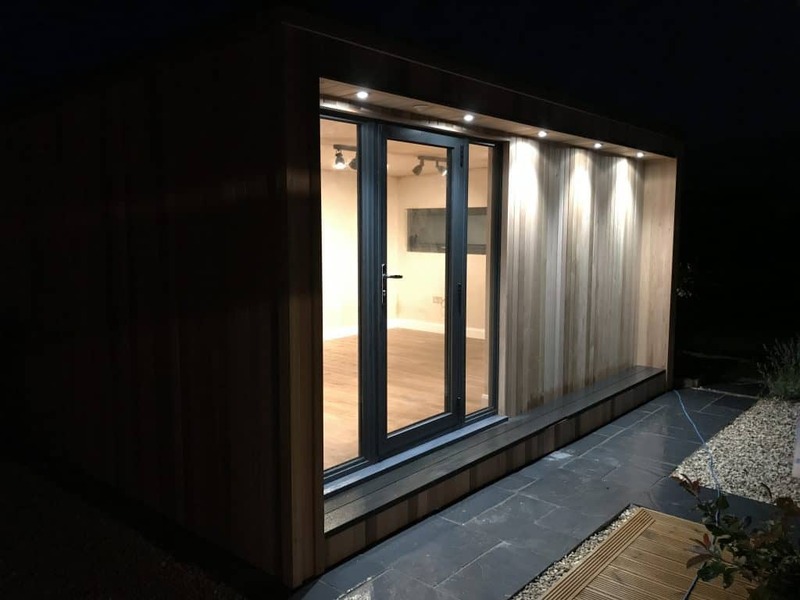 With this in mind we can assist with all aspects of your build, from the design stage all the way through to completion. For more information enquire now. And take the first steps towards your own garden games room. 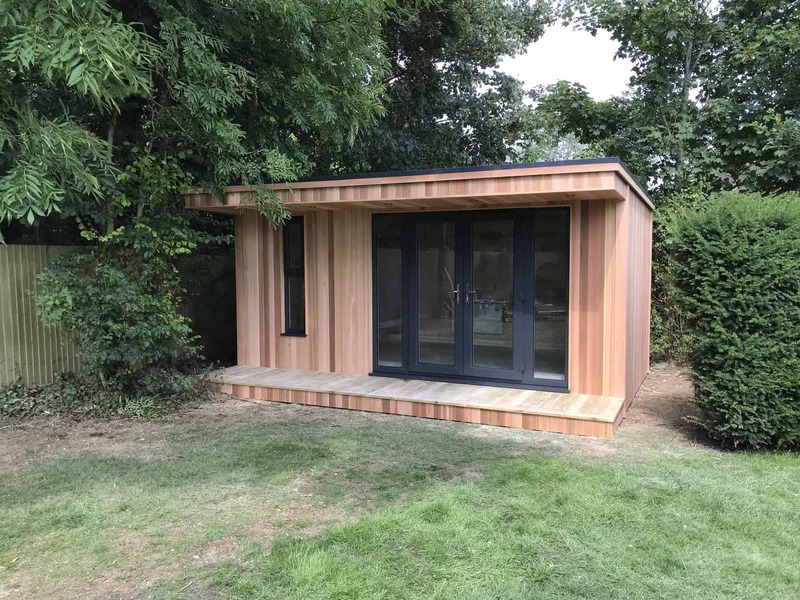 Luxury Garden Studio 7m x 4m, this is one of our Canopy Garden Rooms. It is clad in red western cedar with a 1m canopy that comes as standard with down lights. 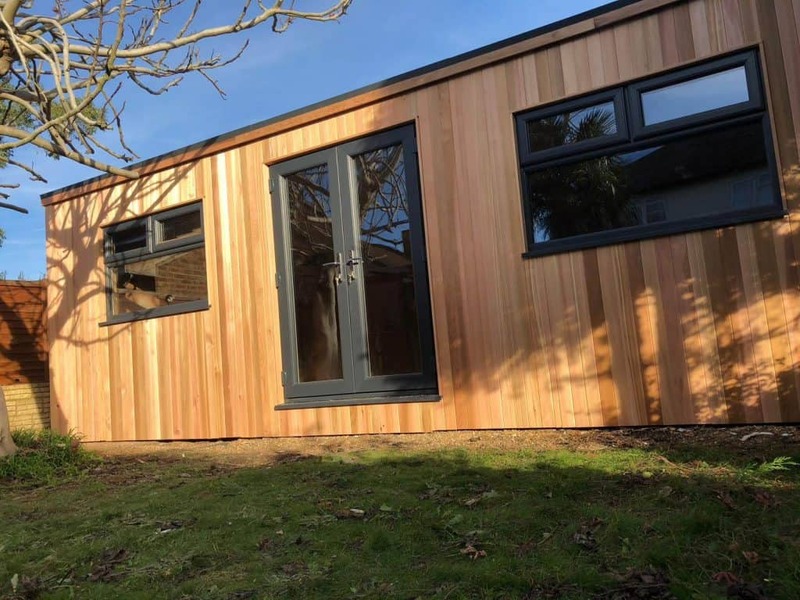 This luxury garden studio has the upgraded aluminium windows and doors. 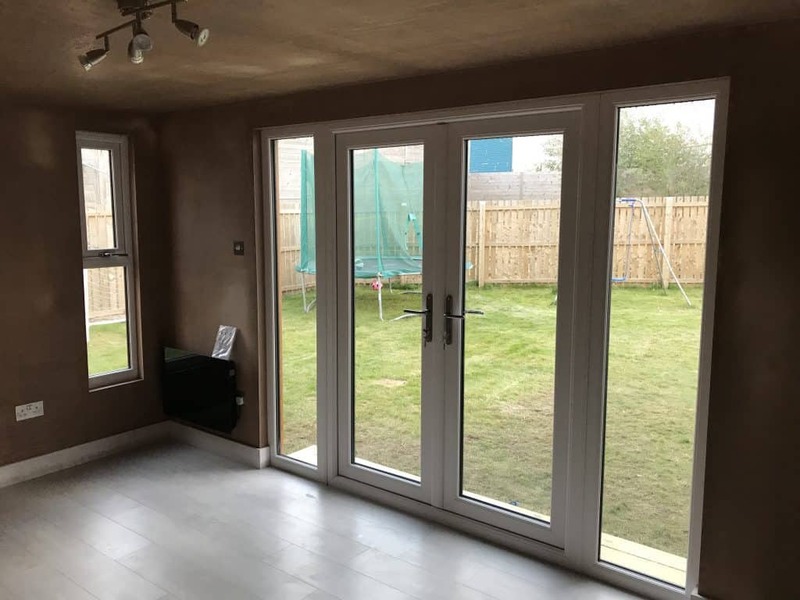 This package that consists of 2.5m Bi-Fold Door’s with a 500mm corner section full height window. A 400mm x 1600mm top opener window, 600mm x 450mm Top opener window, and a 1000 x 500 Top opener window. Internally it is divided up into three separate room. Each room fitted out with lights and power sockets some of which have USB plugs. 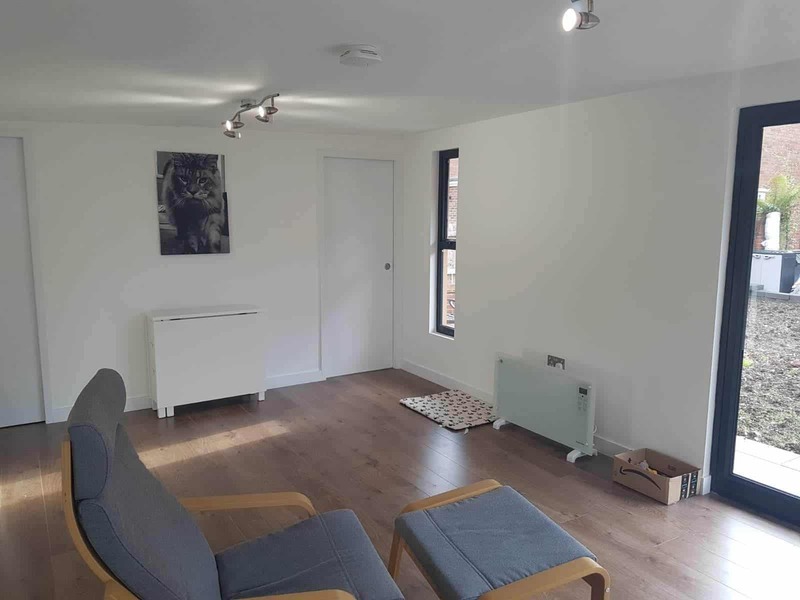 Also we installed cat5 cable in the building for the client to get connected at a later date. 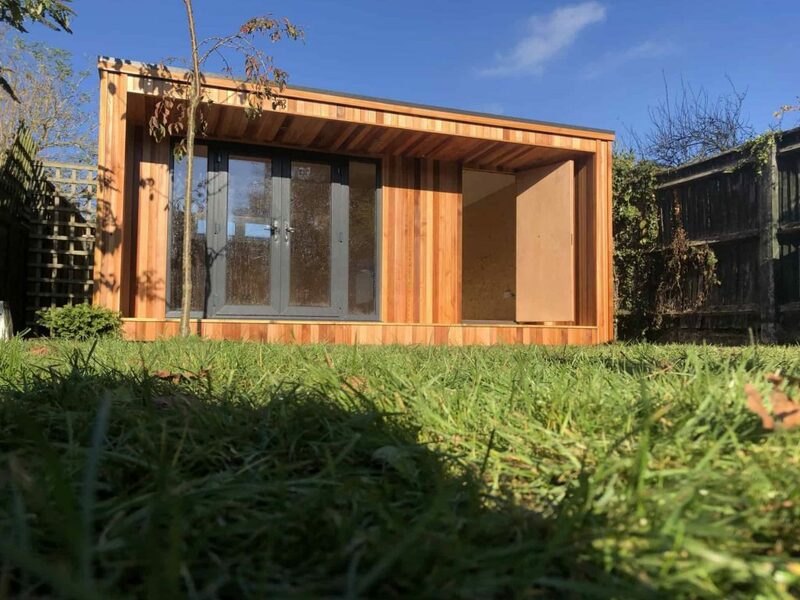 Initially When Karim contacted Modern Garden Rooms he was looking for a 6m x 4m garden room. And he was unsure which style he was wanting. We arranged for Karim to visit one of our completed builds. Our recommended style for his build was a canopy room and working together with Karim we conducted a site survey. 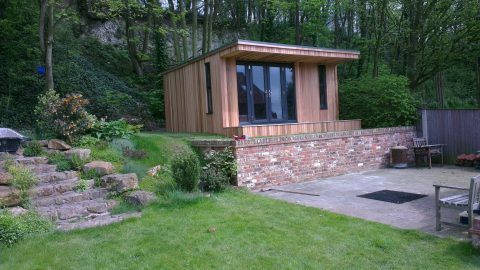 And with the area available we were able to design this luxury garden studio. Home Office 5m x 3m concave, including aluminium window and door. 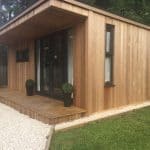 When Mr Shepherd came to us he was looking for a modern and stylish garden room. He needed a space that he could use as a home office. During the initial site visit it became clear that our customer knew exactly what he wanted. 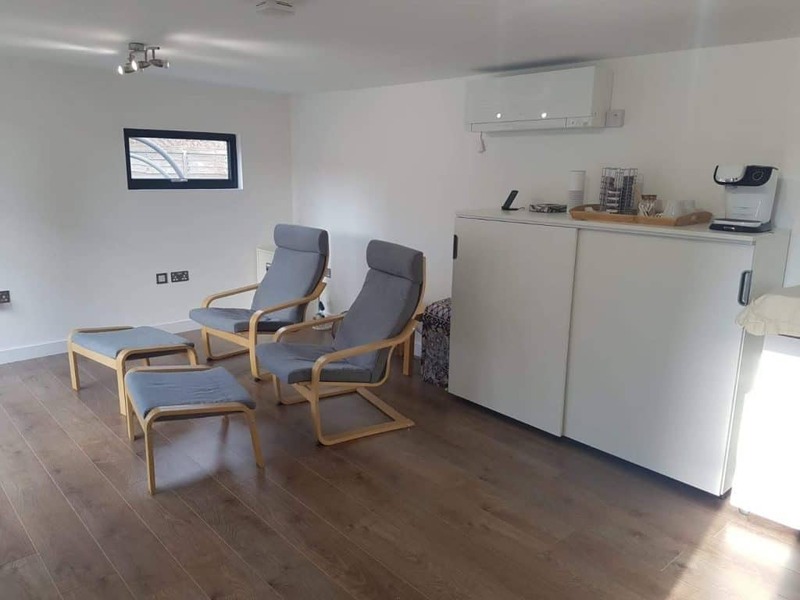 He had a floor plan and specification already drawn up and just wanted to make sure that everything he required was possible and if we could add anything to the build which he may have missed. 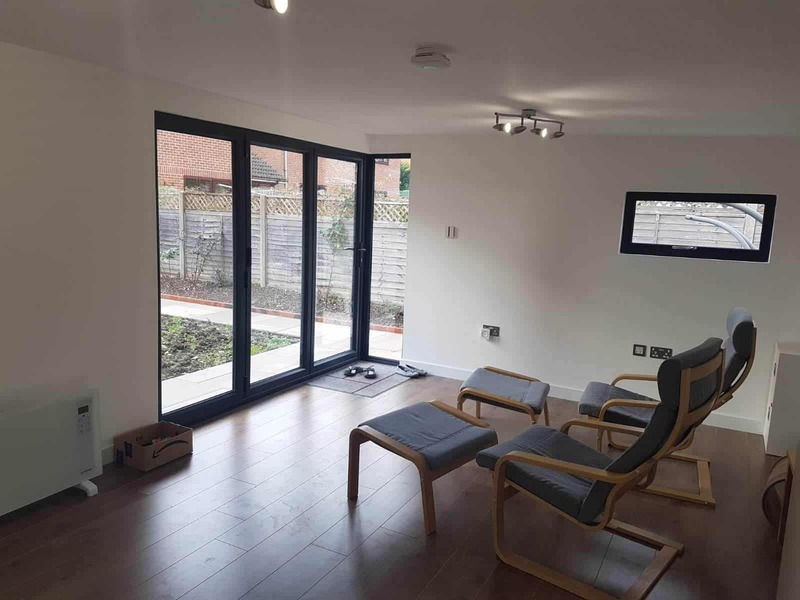 The aluminium windows and doors were to be colour matched with those already installed in his house and the profile too. – All of which we were more than happy to do. 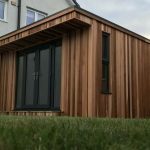 As a result we designed this 5m x 3m concave garden room, we kept the concave section of the room down to 300mm so that it wasn’t imposing. Finished it off with aluminium window and door along with the composite decking. 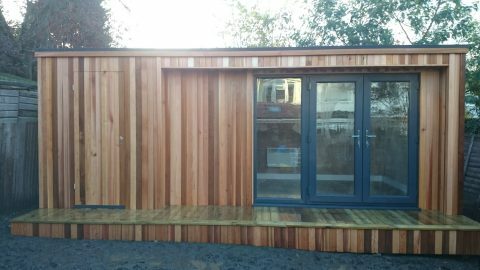 Home Garden Office 3m x 4m, cedar clad with 2.5m UPVC French doors and a 1.5m x .5m double opener window. 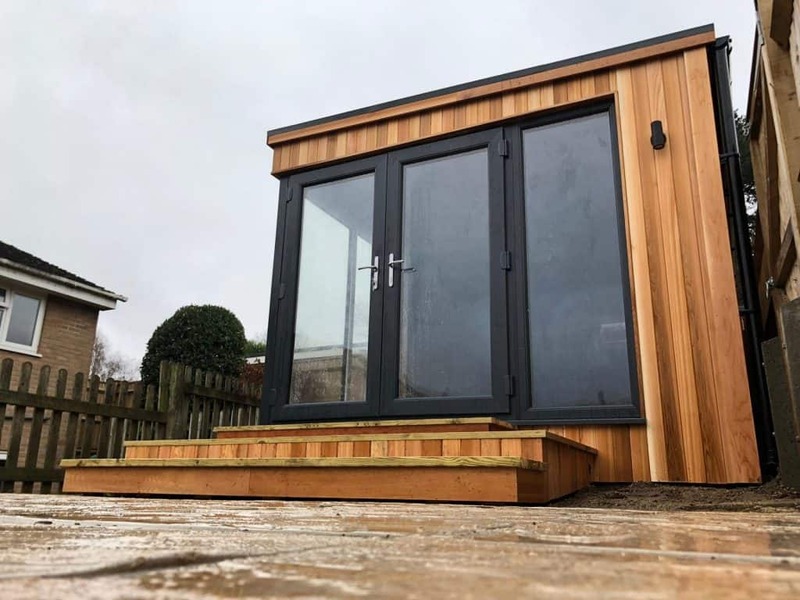 Our Canopy style room with 1m softwood decking, internally finished with Laminate flooring, 4x double sockets and a panel heater. 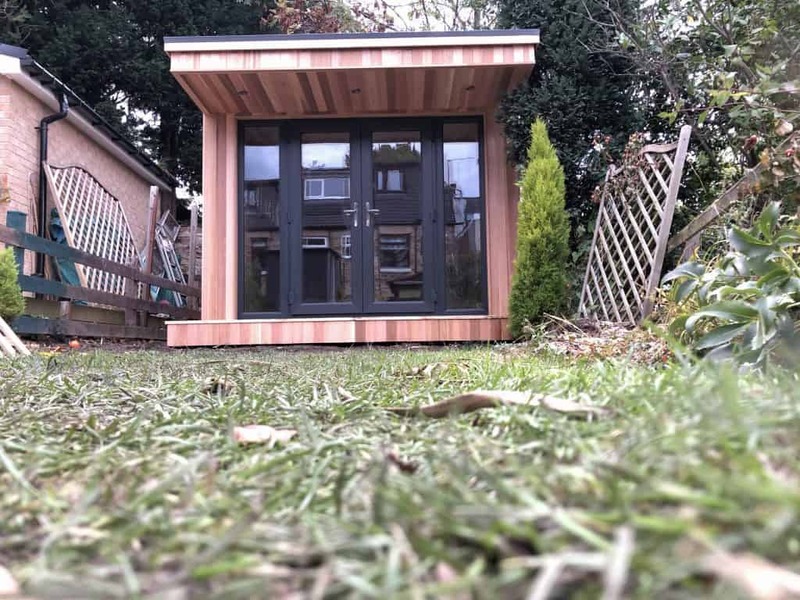 Meridith came to us wanting to use the bottom of her garden which didn’t get much use in spite of her garden only being narrow, to build a Home Garden Office. The garden was only narrow so we built a nice little canopy room. 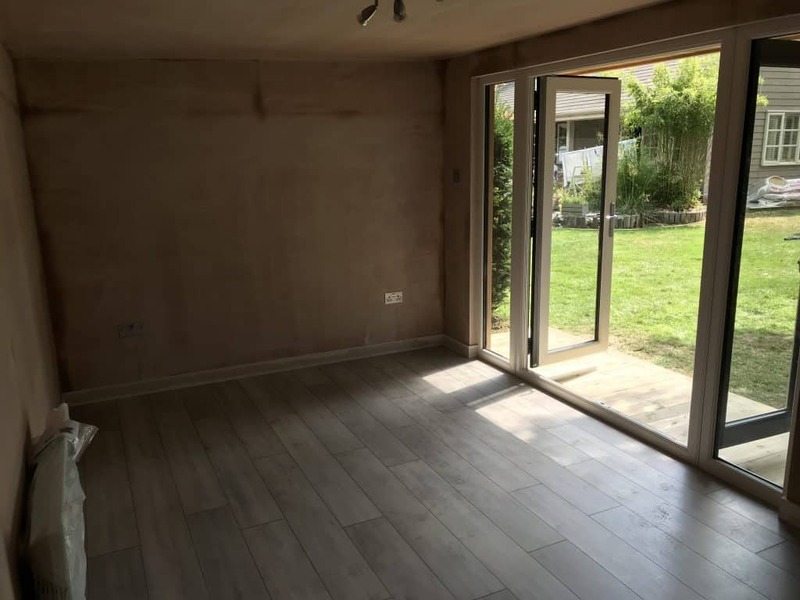 Fitting the full width French doors to the front of the building let a lot of natural light in and gives the feeling of been in the garden. We fit a side window to let in the light on an evening but kept the window size down as not to be intrusive to the neighbours garden. 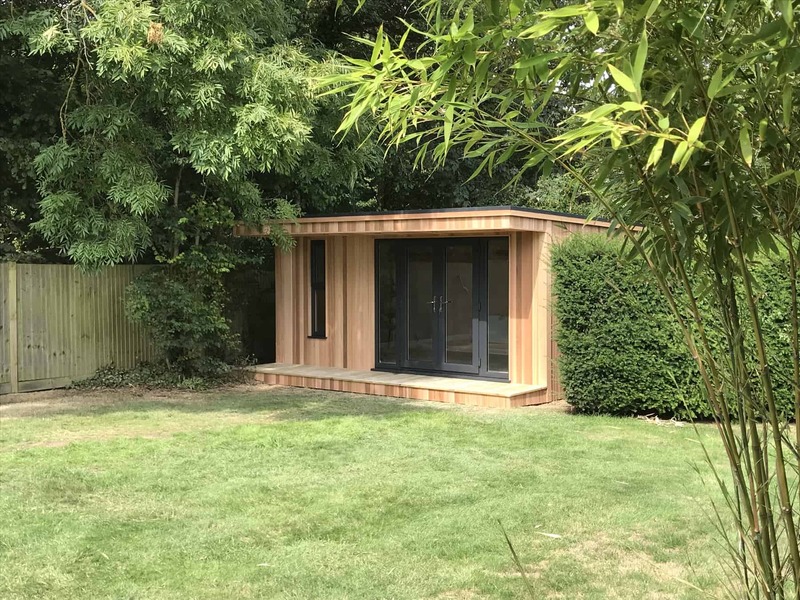 Garden Studio 6m x 4m including to the right a storage area with a hidden cedar clad door. Siobhan and her partner wanted to replace their shed at the bottom of the garden with a room. It was to be used as an office/work-space with a storage area alongside. Having 2 kids and also working from home meant that the house was becoming crowded and a little cramped. 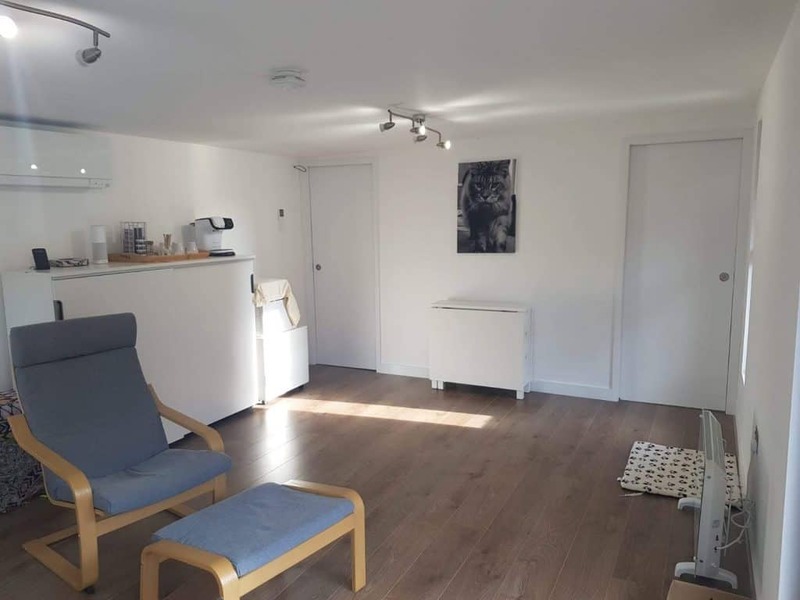 So, having a separate room at the end of the garden gave her family some much needed space back in the house. 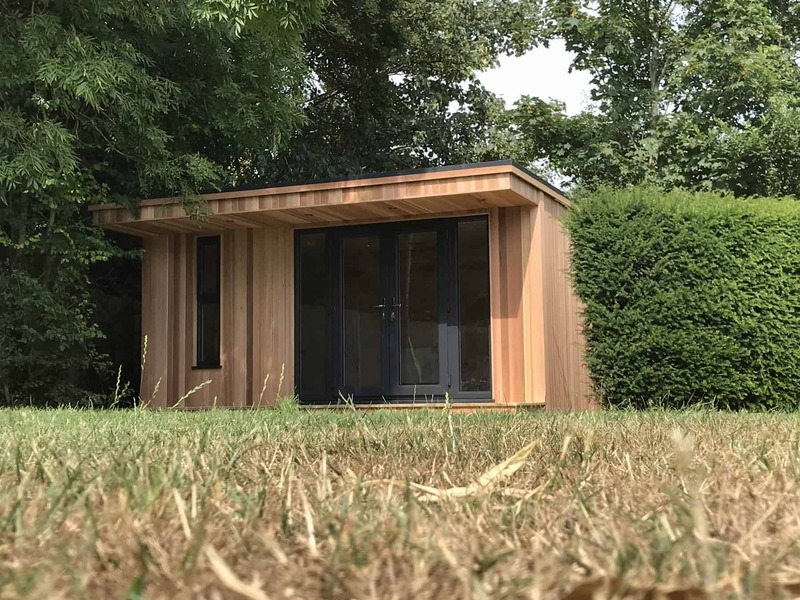 As a result we designed this stunning Concave Garden Studio. Having the door to the storage area on the front of the building saved on space in the main office room. 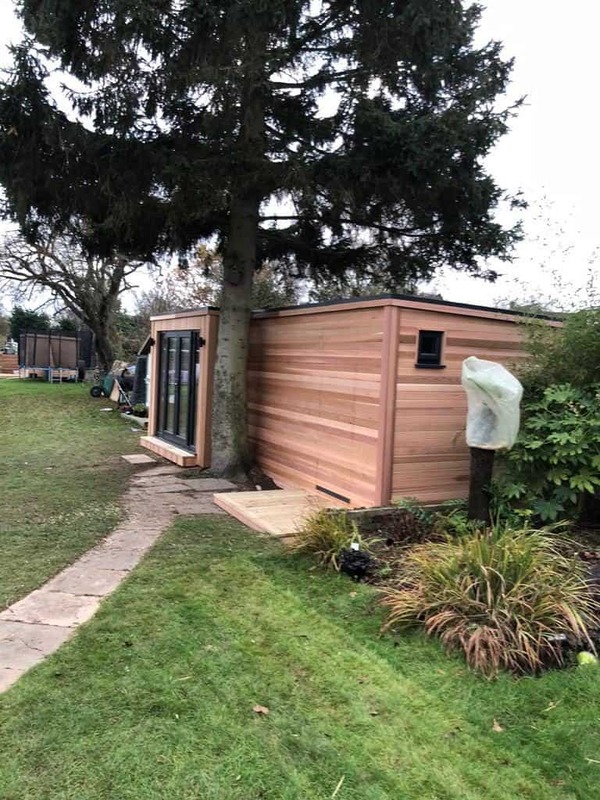 Fitting the cedar clad door has also kept the building looking stylish and the room blends in well with the rest of the garden. 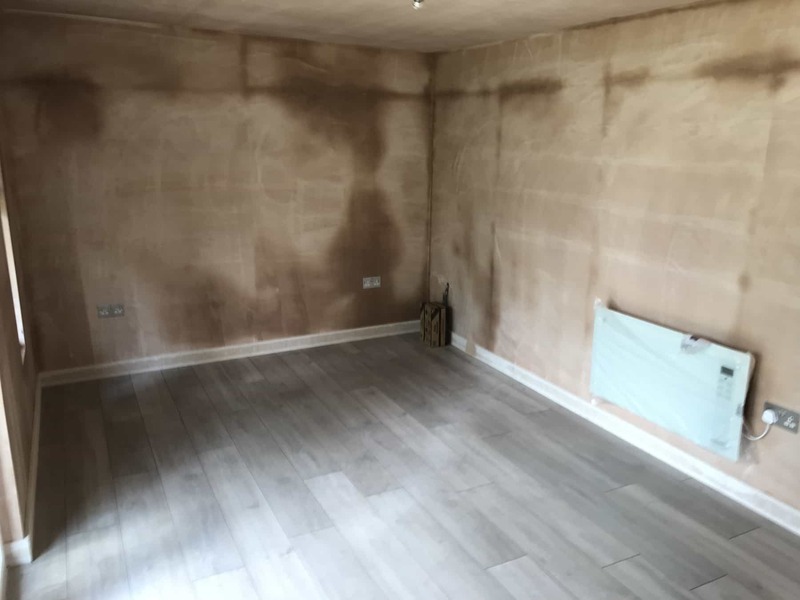 The room is left with a laminate floor internally and all walls and ceilings professionally plastered ready to decorate once dry. 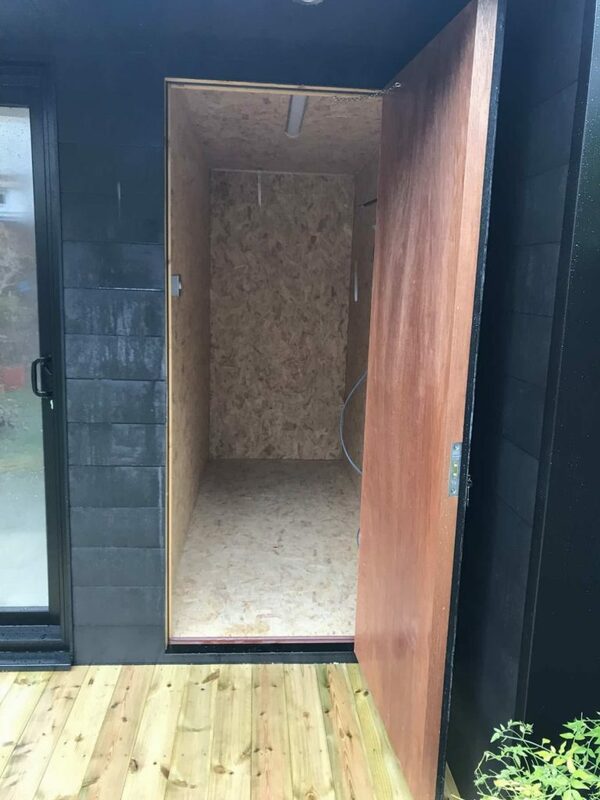 The shed has OSB on the walls so whilst being trendy it allows hooks and shelves to easily fixed to. Once the build is complete we completely tidy the site keeping disruption to a minimum. The building is also given a wash down with water and the windows and doors cleaned. 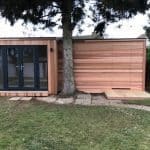 The cedar cladding can be left to fade back to a natural silver colour. Alternatively you can apply a couple coats of protective oil, which has UV protection and slows down the fading process. 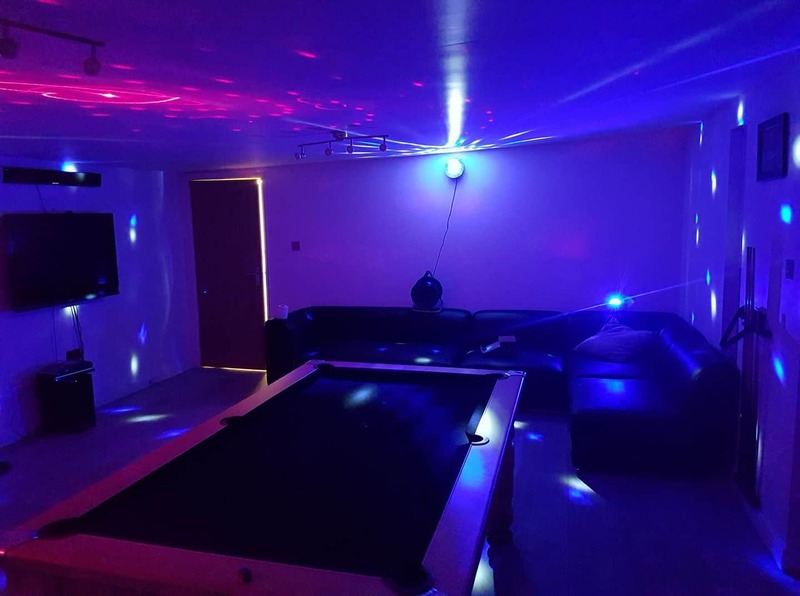 Inside every man, surely there is a small part of him that dreams of owning his very own Man Cave. A sacred place to which he can retreat after a hard day at work, or whatever he does. 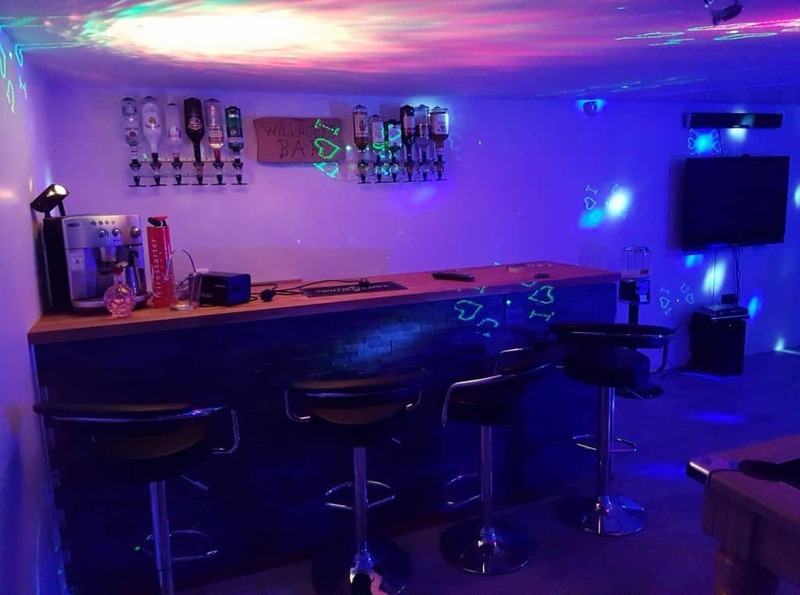 A place where he can tinker with his tools, play music or video games, or maybe just watch TV with a beer from his Man Cave’s very own fridge, free from interruption and judgement; what goes on in the Man Cave, stays in the Man Cave. If you’re a man whose house is overrun by children, noise and toys, or was decorated by your significant other and you’re not supposed to put cushions in the wrong place, then you know that in your heart you long for a space of your own. Matt’s Garden Man Cave measured 7.5m x 4m. The model was a Cube garden room and it was clad in grade 2 red western cedar. 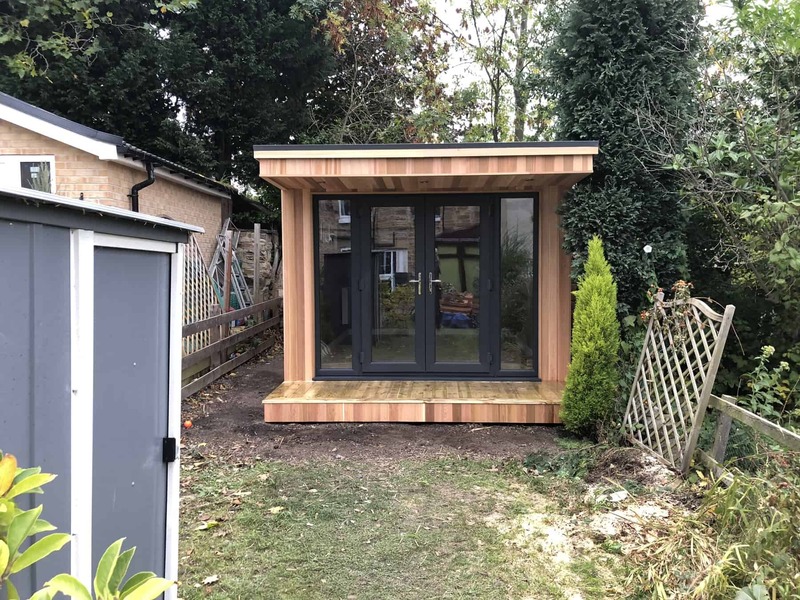 When Matt first contacted Modern Garden Rooms, he was looking at demolishing the existing shed at the bottom of his garden; a large but rickety and old fashioned building that he had inherited with his recent house purchase. 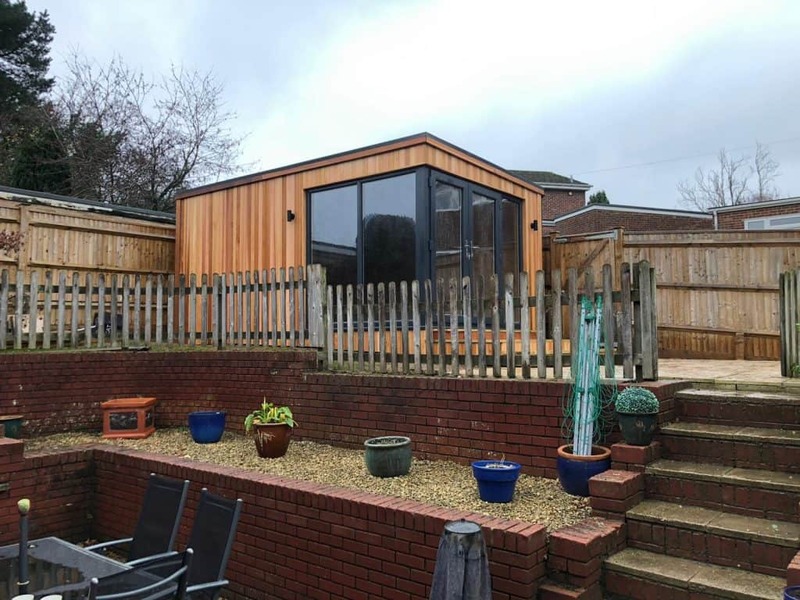 He wanted to replace it with something much less drab and draughty; a garden room with the wow factor. 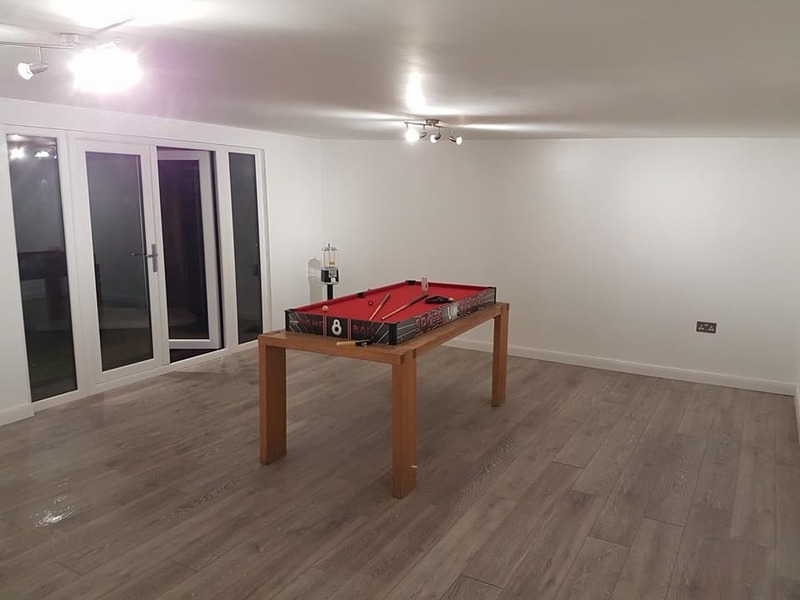 Naturally, his priority in the new building was to maximise the floor space giving him room for everything he wanted to keep inside his Man Cave, but he was also hoping that the building would be significantly more stylish and modern than the old shed at the bottom of his garden, without looking dominating and out of place. Taking on Matt’s ideas, we designed this cube room for his Man Cave. The footprint was the same as the old building, measuring 7.5 x 4m; not an insignificant space. 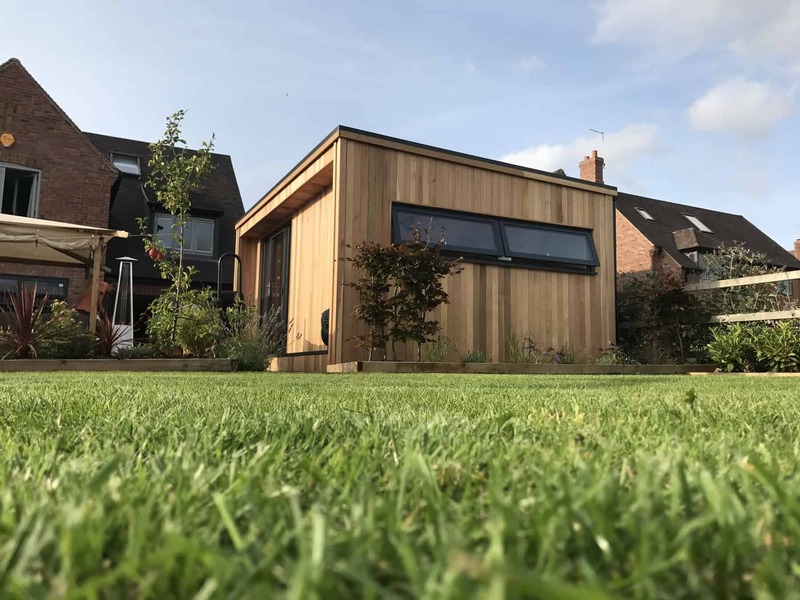 We made the front elevation symmetrical to give a contemporary and stylish feel to the garden room. 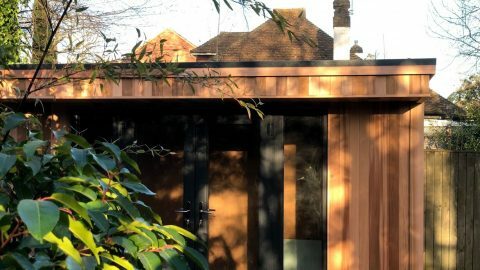 The timber cladding on the outside of the garden room was made from western red cedar. This gives a warm and vibrant feel to the building, which will fade to less bold shades of grey over the years allowing it to blend naturally into the landscape; or if preferred it can be painted and varnished to keep it looking new. 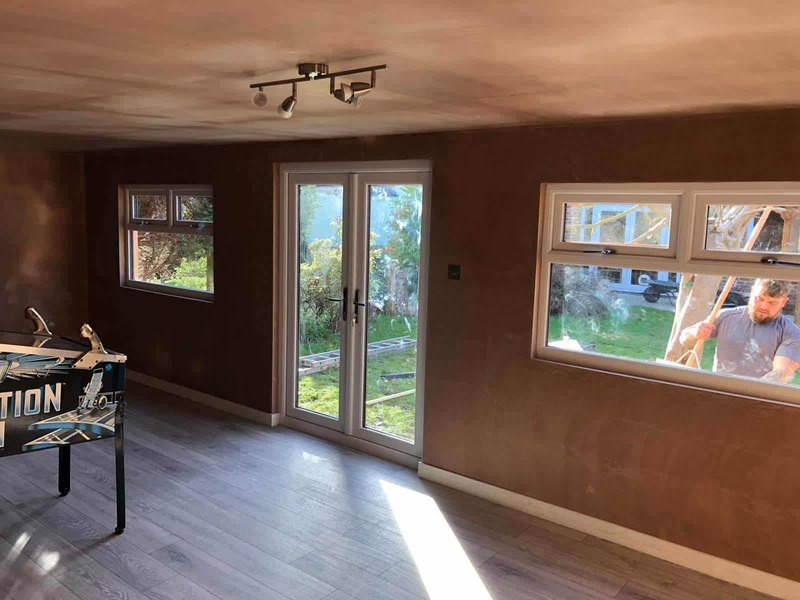 With windows and doors placed at the front to let natural light into the room and allow privacy to the rear, inside of Matt’s Man Cave was plasterboarded and skimmed ready to be painted. Sadly, we can’t tell you what the inside of Matt’s Man Cave looks like now, or what it is being used for. Perhaps he uses it to play darts and drink beer, or maybe it’s his crime fighting HQ. We may never know. 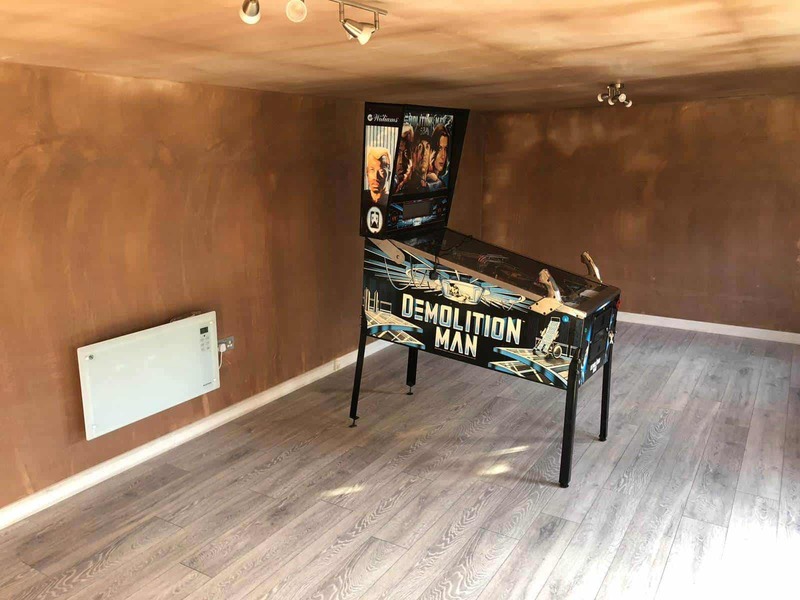 Whatever he’s doing though, he’s doing it in the Man Cave of his dreams. 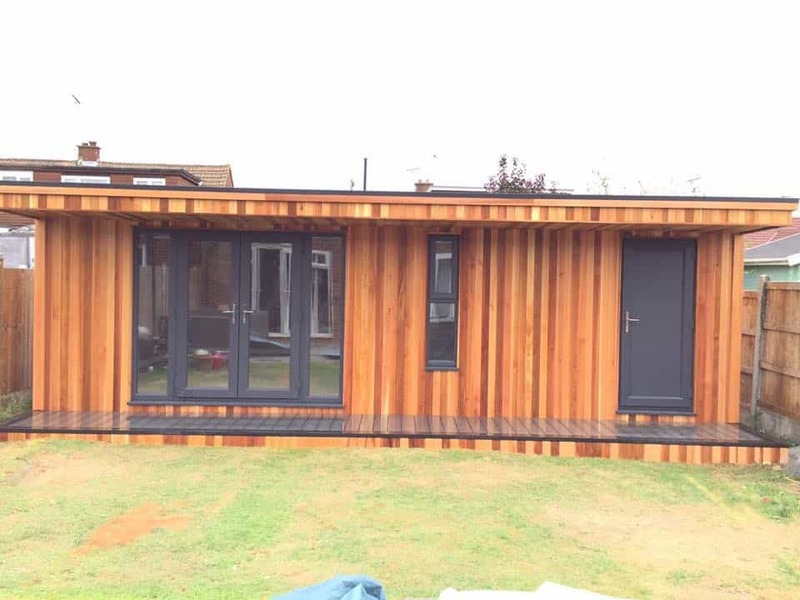 Corner Garden Room 5m x 3m, with 1.8m french doors full height side and corner windows. 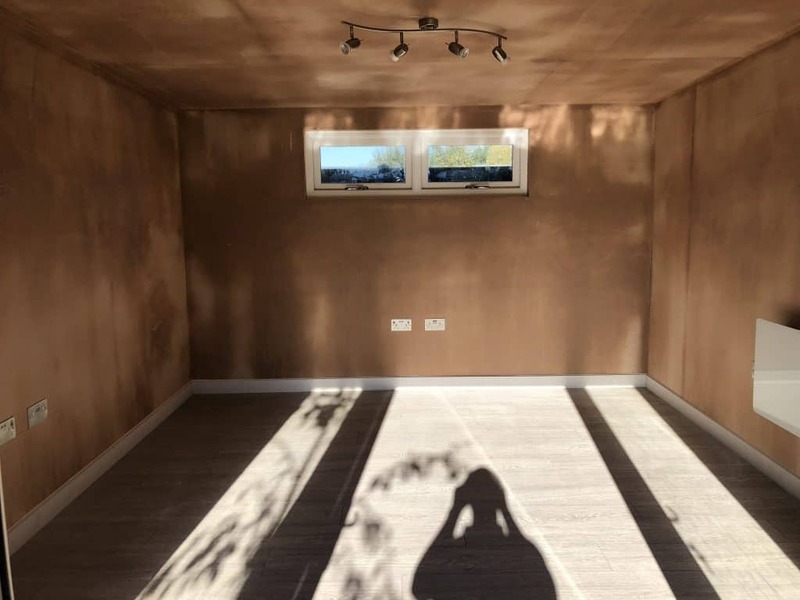 Charlotte was looking for an extra room to be used as an office, when she came to us she was a bit undecided with the design, but wanted to make the most of the natural light available. With this mind we offered Charlotte a corner section window and French doors layout. 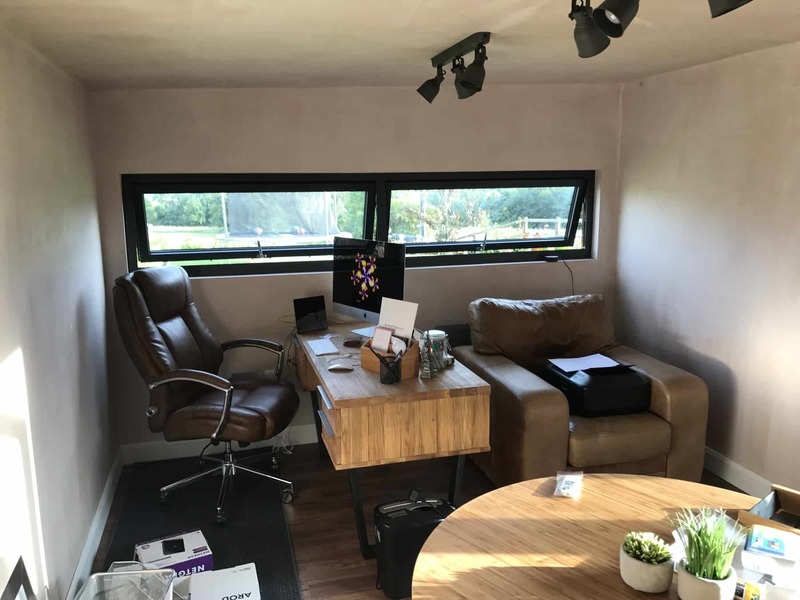 This was incorporated into one of our cube room designs, giving the full benefits from the large glazed frames on the front and the side of the room. 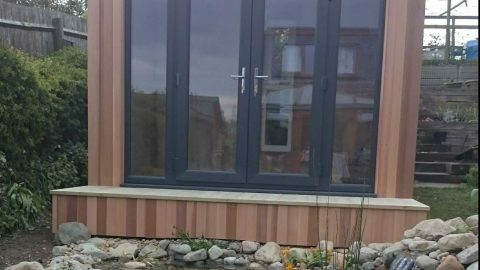 The front decking was to our customers specification allowing easy access into the corner garden room. 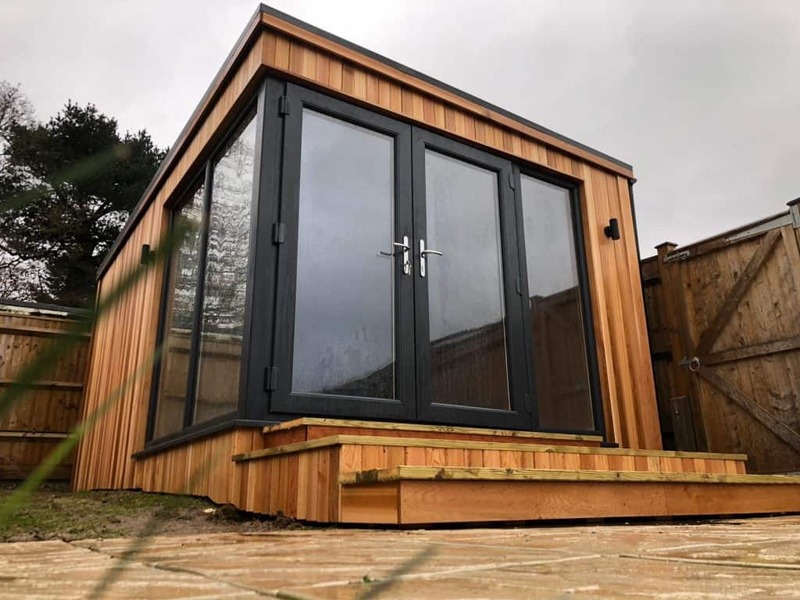 Some clients have no idea which type of garden room they want when they first call us. 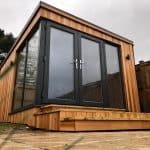 This is of course fine; Modern Garden Rooms is there to help you choose exactly the right build for you space and taste. Others already have their ideal garden building in mind. This striking Black Garden Room was the vision of Philippe and Veronique. 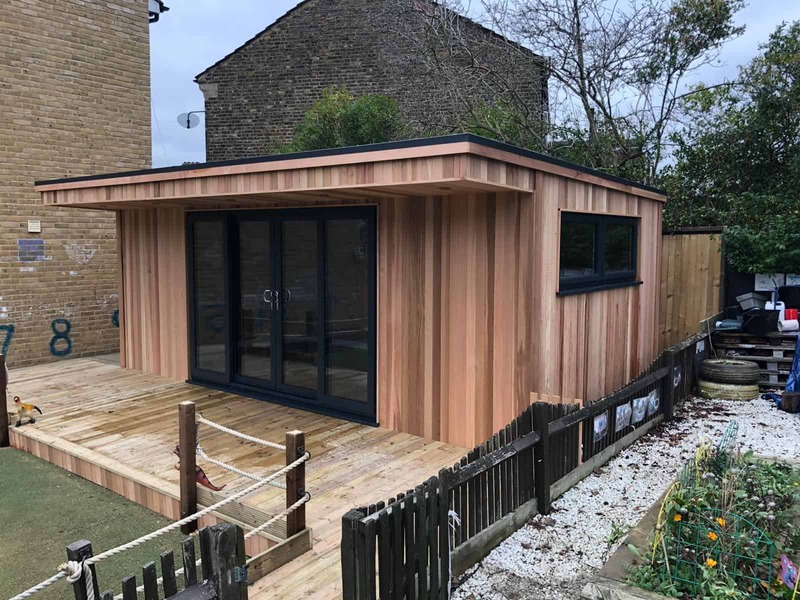 The couple contacted us wanting a new outdoor building for their two young girls to use as a study and a playroom, however they knew exactly what they wanted it to look like. 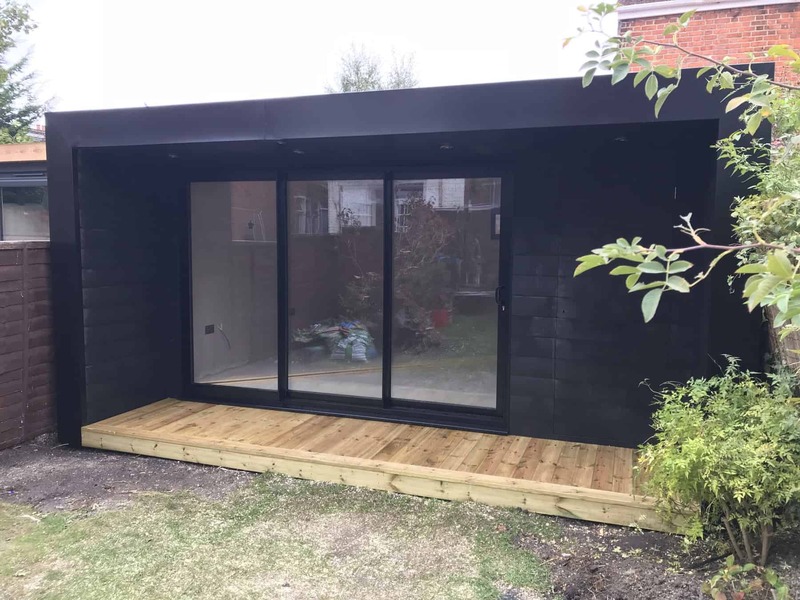 We worked with them to make their Black Garden Room vision into a reality! 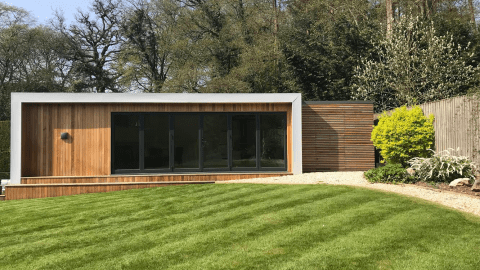 Philippe and Veronique’s Black Garden Room, was a Border Garden Room with integrated storage area and large shed with hidden composite clad door measured 5m x 4.8m. 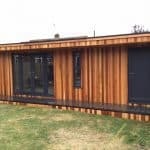 The build was to be clad in low maintenance black composite. 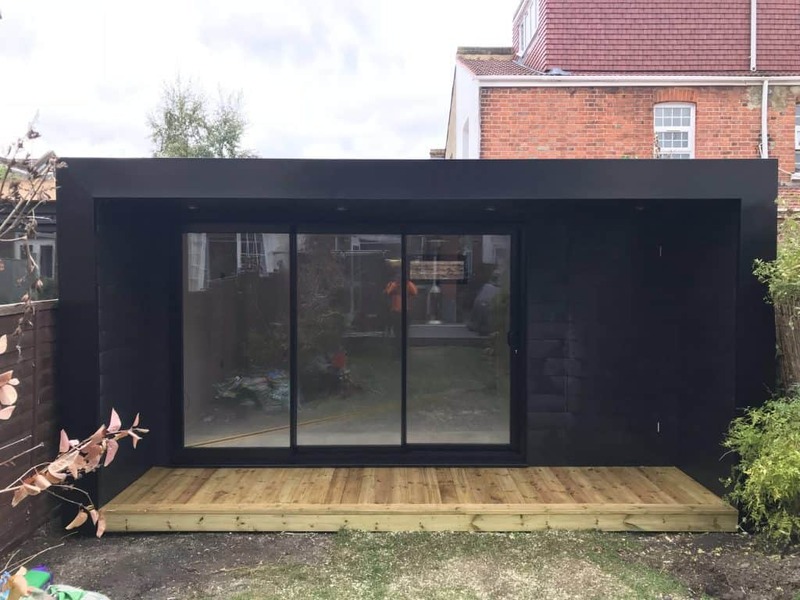 Philippe and Veronique had designs on a new bespoke Black Garden Room at the end of their London garden. 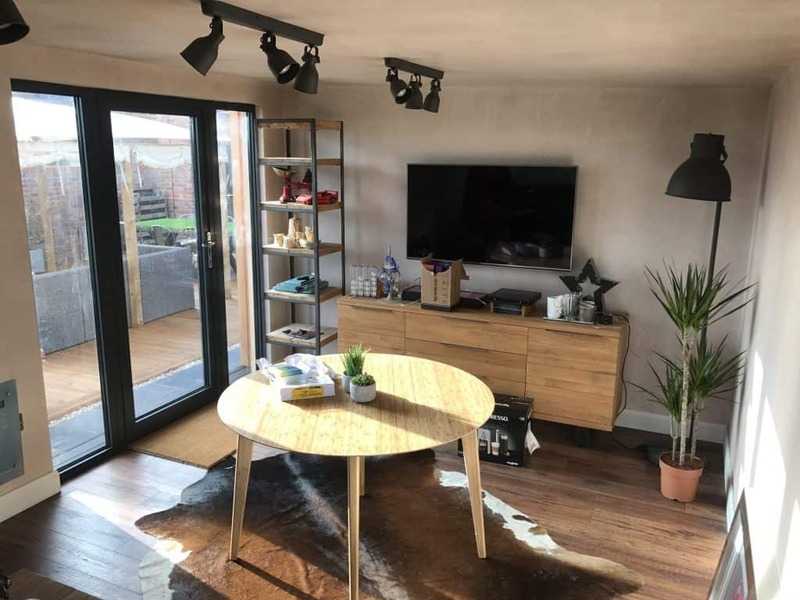 They wanted a space could be used by their two young daughters as a playroom and study as an alternative to extending the house. 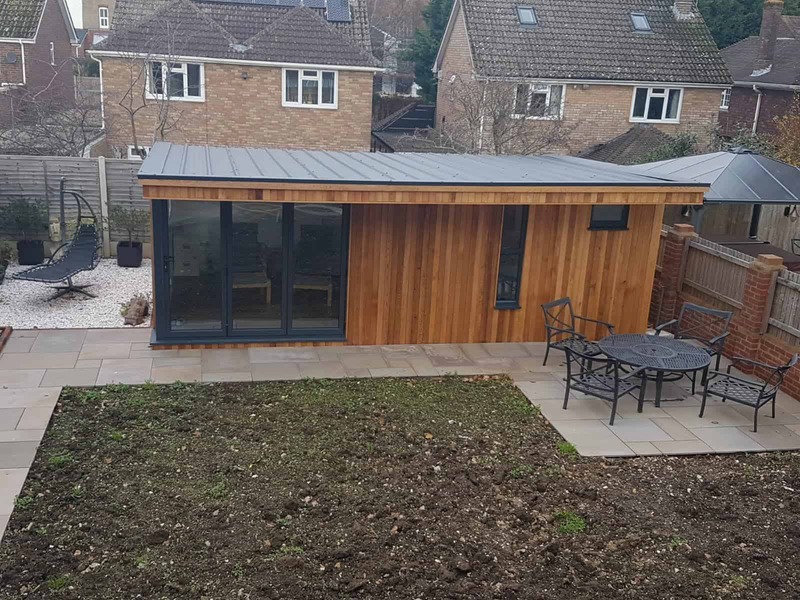 They also wanted an integrated shed storage area which could be used for garden equipment etc, so that there was no additional need for a separate garden shed. 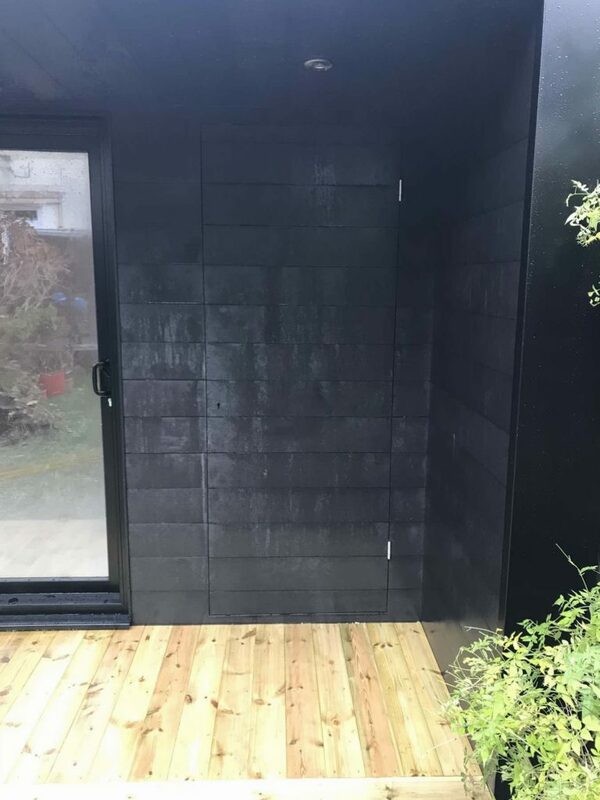 As well as the unique black cladding, they opted for a Border Garden Room with a striking metal trim around the edge. 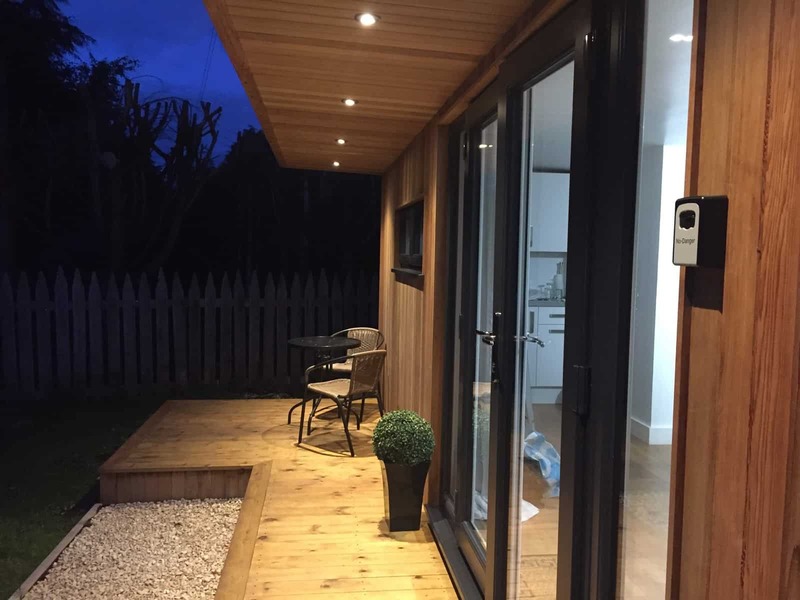 These builds have a more secluded front, with a downlit canopy and enclosing sides, as well as a 1m decking area to the front. 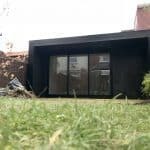 We knew that the Black Garden Room was a particularly tricky build. The space was limited as the build was to cover pretty much all of the 5m width of the garden. In addition to this, access to the garden was limited and all equipment, tools and materials had to go right through the house! 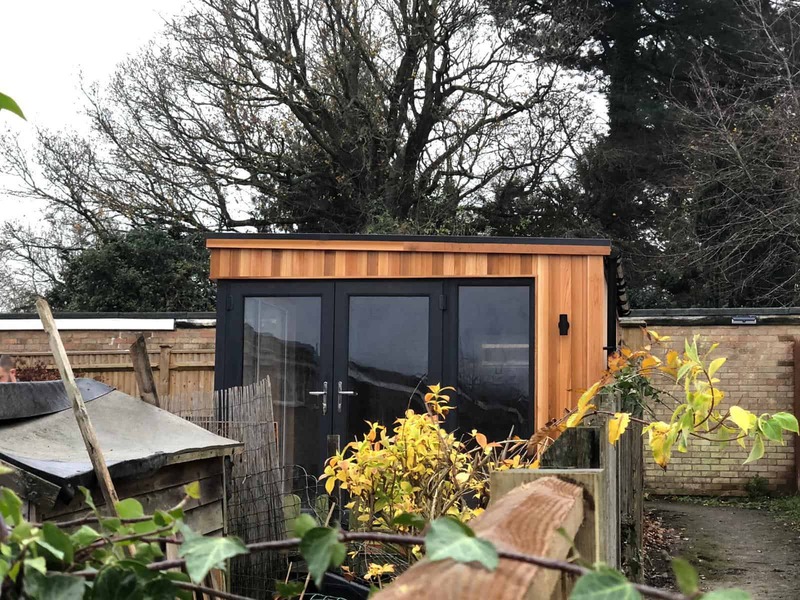 For Philippe and Veronique’s Black Garden Room, we suggested they opt for our Border Garden Room. 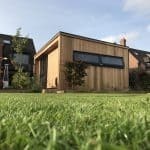 The building measured 5m wide by 4.8m, to fill the space as much as possible, making the most of the full width of the fairly small garden. The garden room, fronted by large, bi-fold doors, was to become a children’s playroom/study. 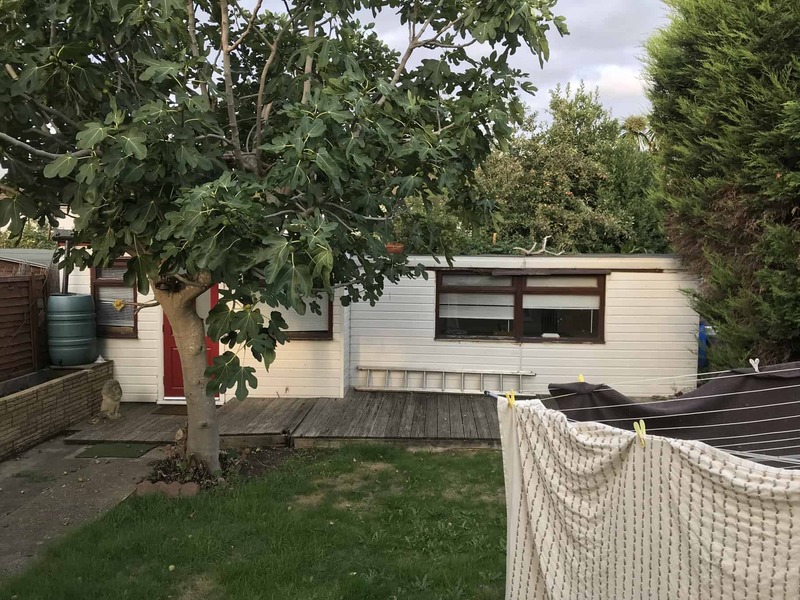 To the right of the building was an extra door leading to a partitioned, windowless shed room for storing garden equipment. 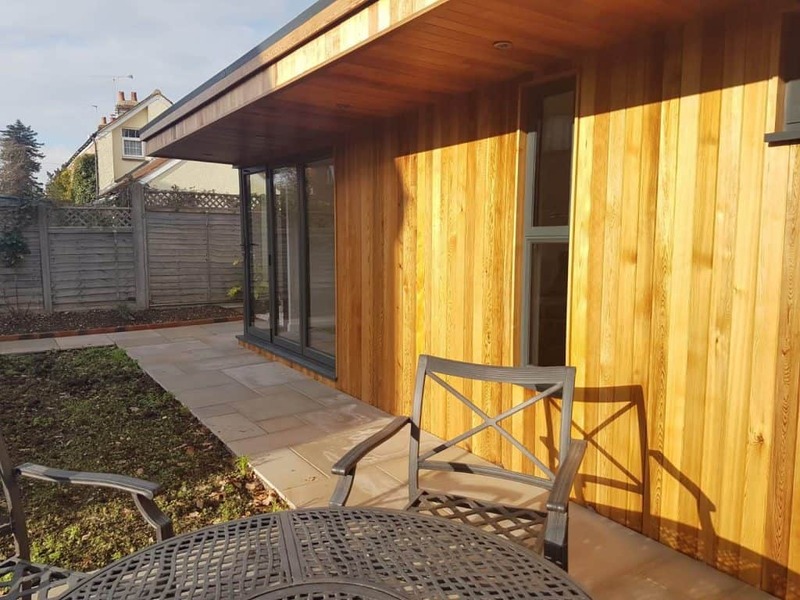 Without the clients having easy access to the sides of the build, we knew that it would have to be a low maintenance exterior; rather than the usual striking natural cedar look, the clients opted for the black cladding. As there was no access to the garden except via the property, we knew that an extra level of care would have to be taken to ensure that all the necessary tools, equipment and materials could be taken through Philippe and Veronique’s London home without causing any damage to their interiors. 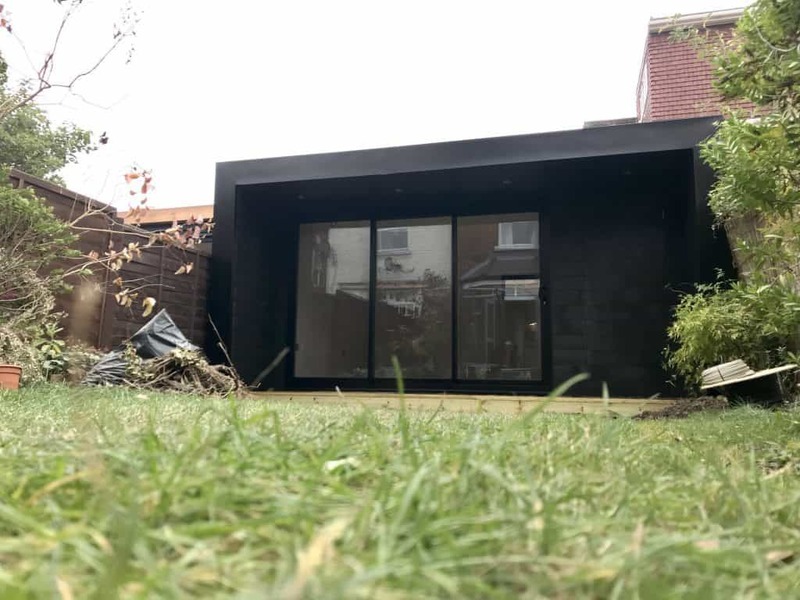 However, we were confident that we would manage it and working with Veronique, who had a keen eye for detail, we managed to build the bespoke Black Garden Room that her family had been visualising. 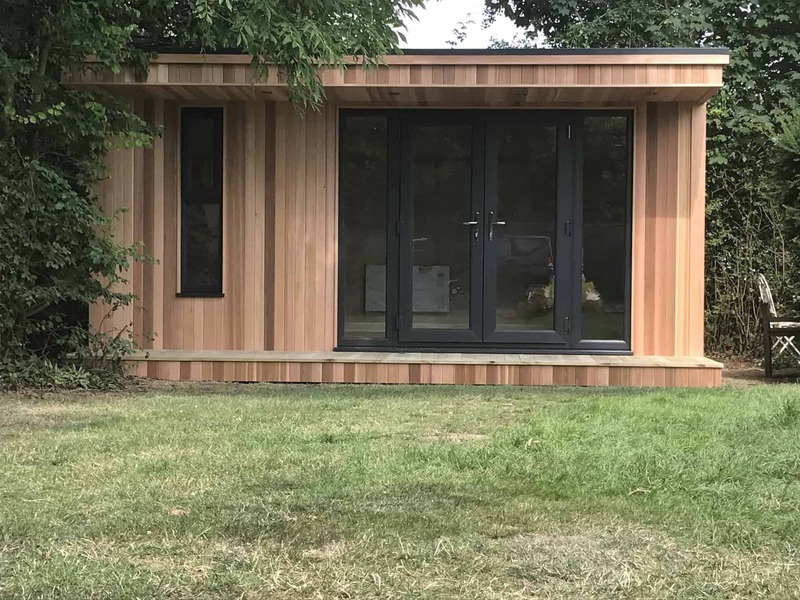 5.1m x 3.1m luxury garden building, with french doors and a 1m decking. 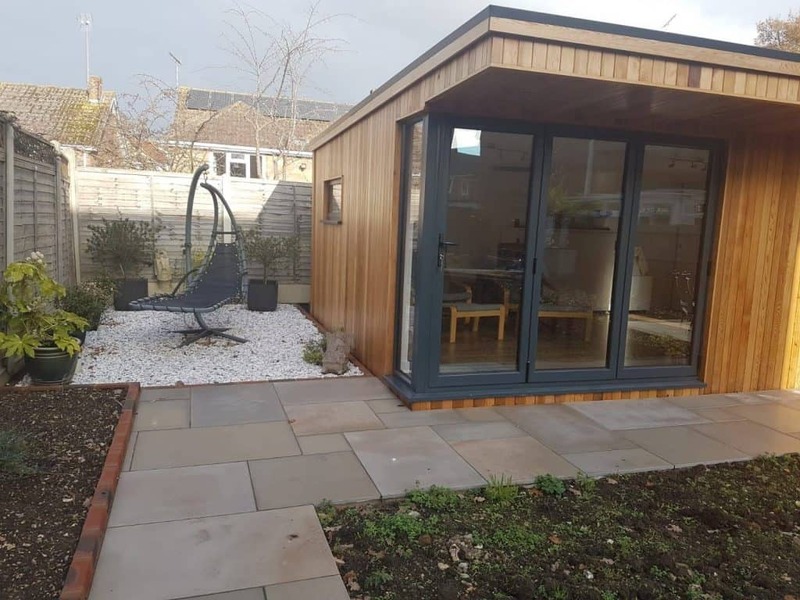 Martin wanted to make the most of a unused section of his garden, because this space was only been used to store garden furniture and gardening equipment. But above all he wanted the building to be in keeping with the garden and not look imposing. 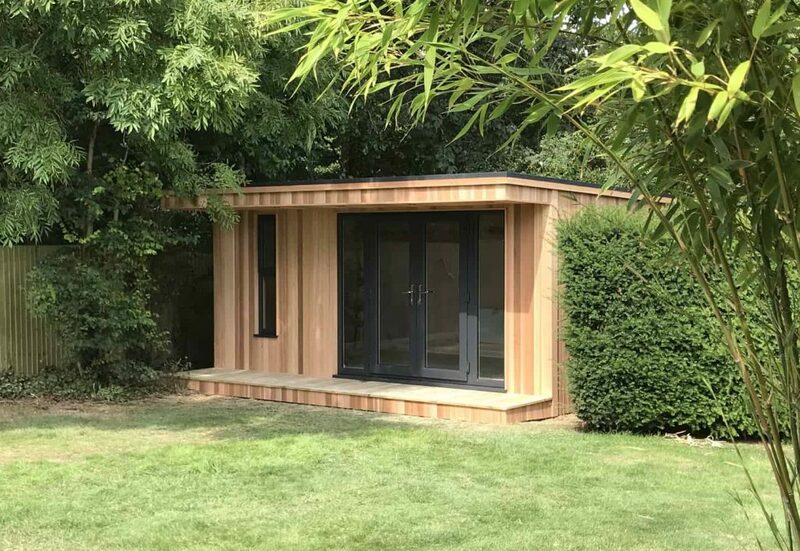 We were able to fit this modern garden room neatly between the trees in the corner of his garden, as a result this garden room blends in well with its natural surroundings. 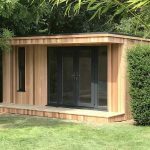 Garden rooms are extremely versatile spaces, with dozens of potential uses. 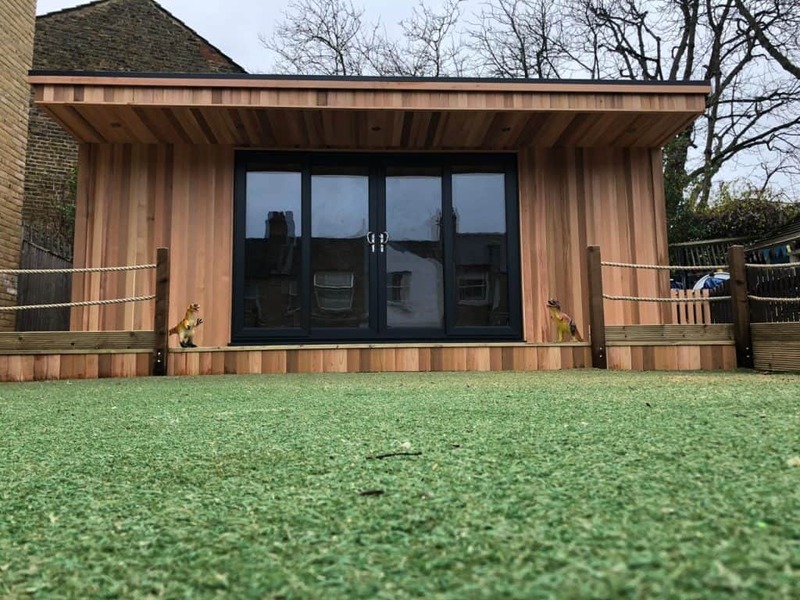 However when Mother Goose Nursery in Peckham approached us for a quote to replace their old classroom with a new garden building, it was the first time that Modern Garden Rooms had been asked to install a children’s Garden Nursery. 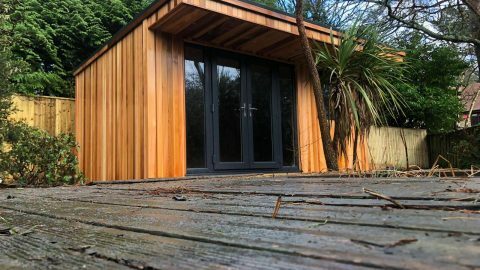 The polar opposite to the classic man cave, a Garden Nursery is not intended to be a modern, stylish space for grown-up pursuits or relaxation. This new garden building needed to be a much more practical space. A space designed with children in mind, where they could be free to do the things small kids do; like make a lot of mess and noise. A place for toys, bright colours and laughter. The Garden Nursery building measured 6m x 3m. 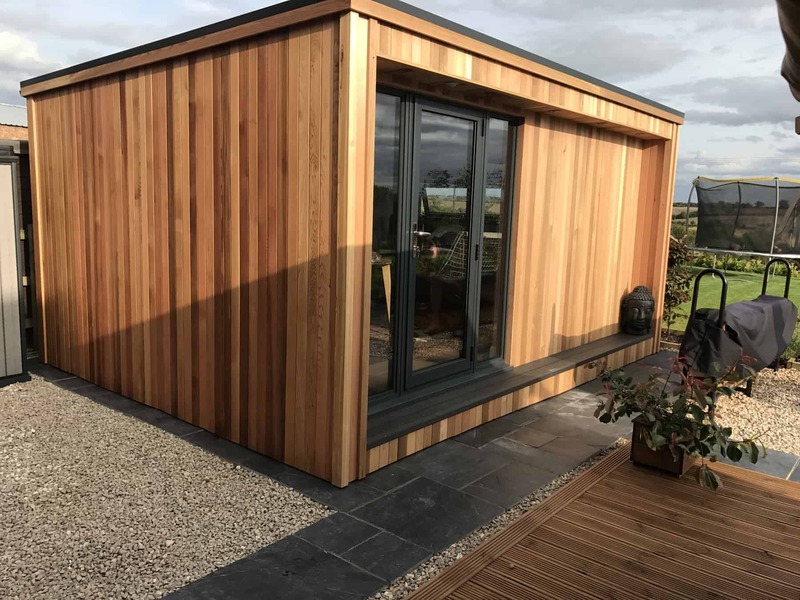 The model was a Canopy Garden Room surrounded by 2m timber decking and a rope barrier, clad in red western cedar with 3m UPVC sliding patio doors. 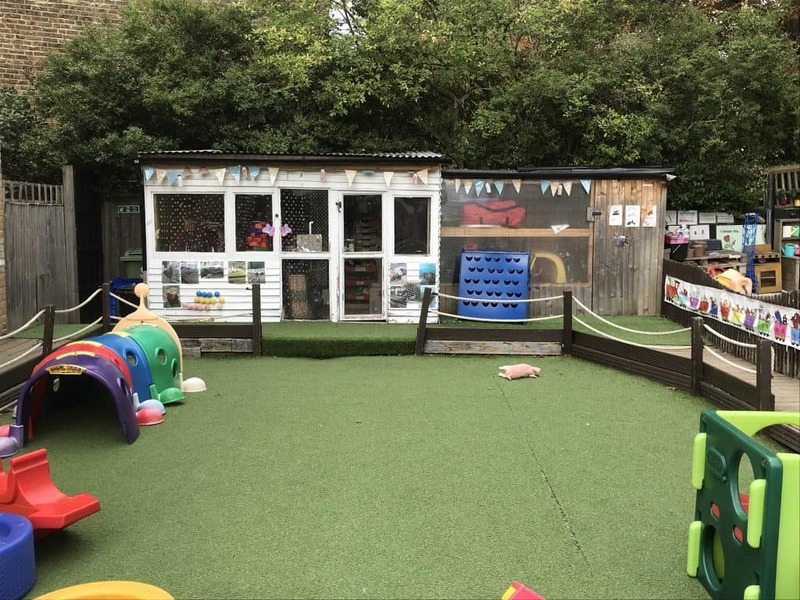 When they contacted us, Mother Goose Nursery had two large but awfully rickety-looking garden sheds which they were using as makeshift classrooms and outdoor toy storage for the children attending the nursery. They had served the nursery well, but unfortunately these old garden buildings were neither as warm nor as solid as they really needed them to be, and were now in dire need of replacement with something sturdier and more secure. 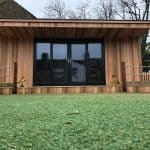 Mother Goose Nursery’s main requirement was that the new space be big, open plan, warm and safe for the children to use as a classroom. 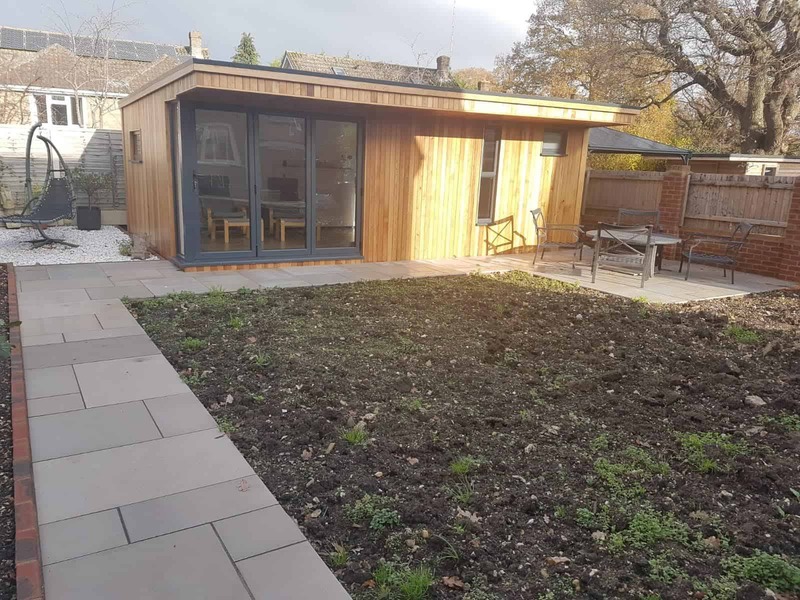 They also wanted a large decking area to surround the new Garden Nursery, which would connect to the nursery’s existing decking and save them needing to landscape the whole outdoor area. 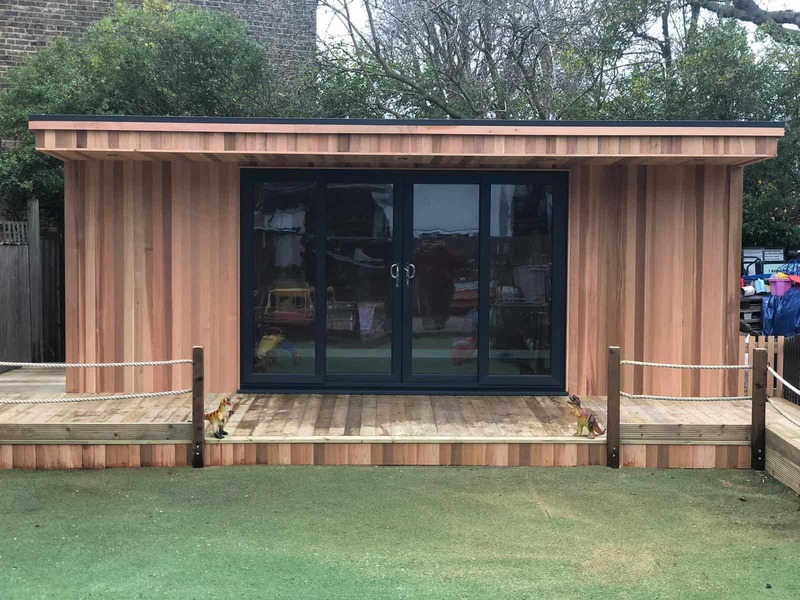 Our design for Mother Goose’s Garden Nursery building was a fairly large 6m x 3m canopy room, with 3m UPVC sliding doors to the front and centre, and windows to the side to let a good amount of natural light into the room. 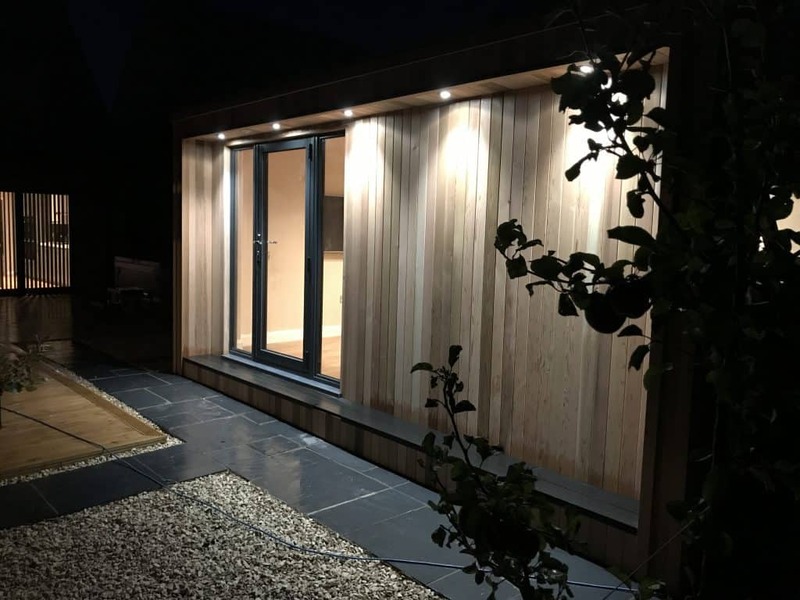 A large canopy, complete with downlighting to illuminate the building entrance, was designed to overlook the 2m decking built to the front of the building. This canopy provided a little shelter and shade to the front of the room. 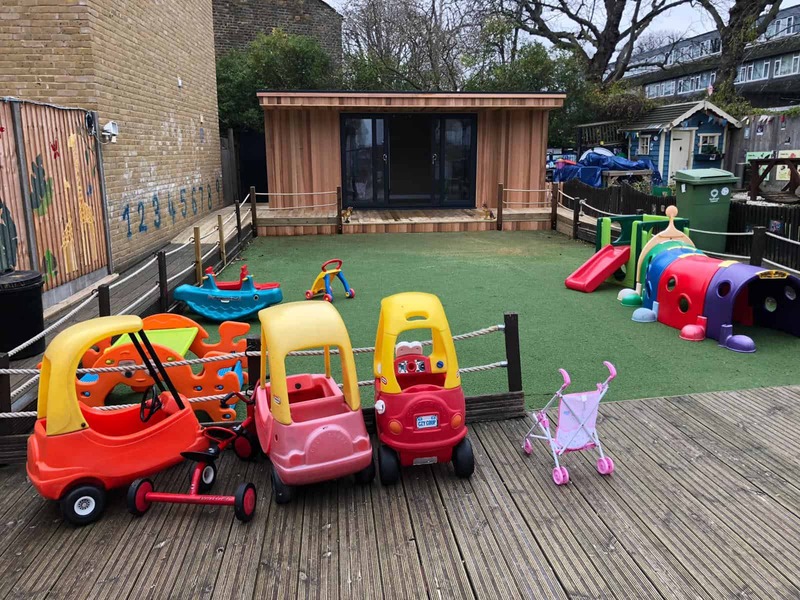 This decking continued around to the side of the Garden Nursery, providing a large usable space for the children to use ride-on toys. 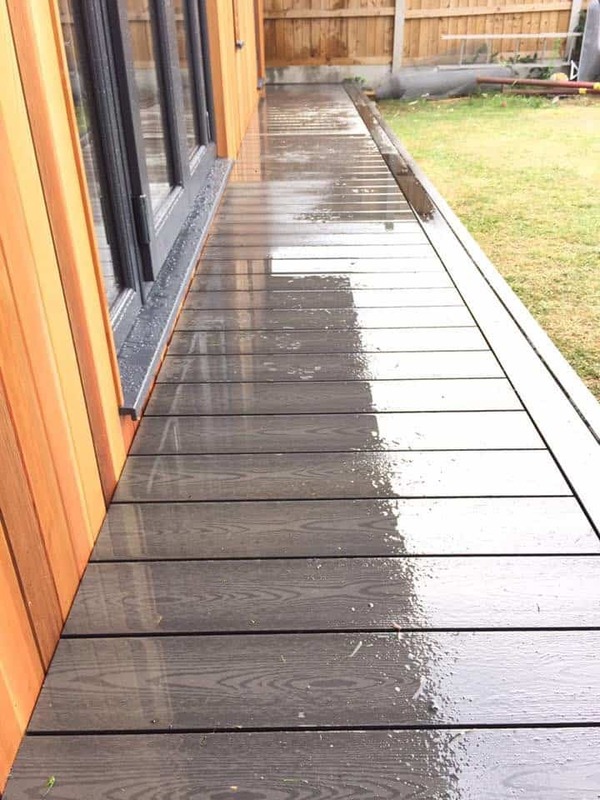 The new decking connected to the existing decking surrounding the ‘grassed’ outdoor area, and the safety ropes and kick boards stayed in situ. 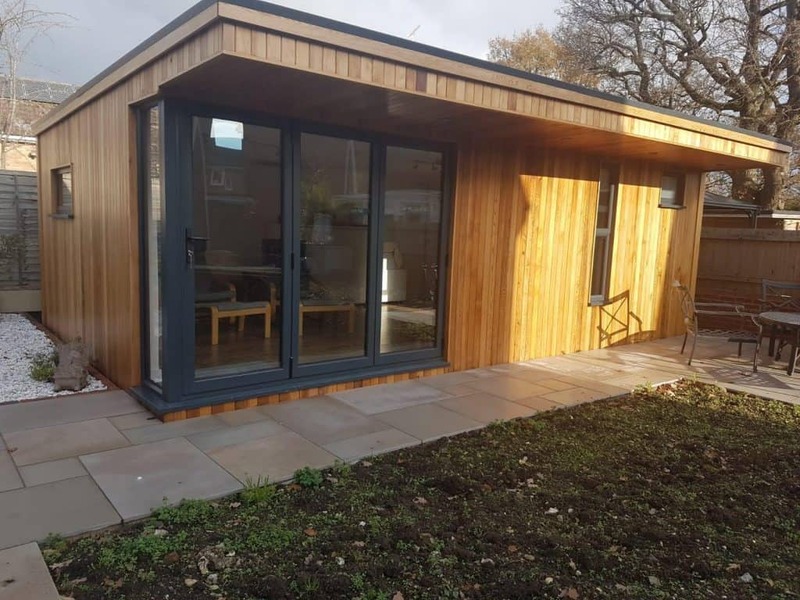 The new Modern Garden Rooms Garden Nursery, a far more attractive and more secure building, was installed as quickly and tidily as possible, to avoid nursery closures. 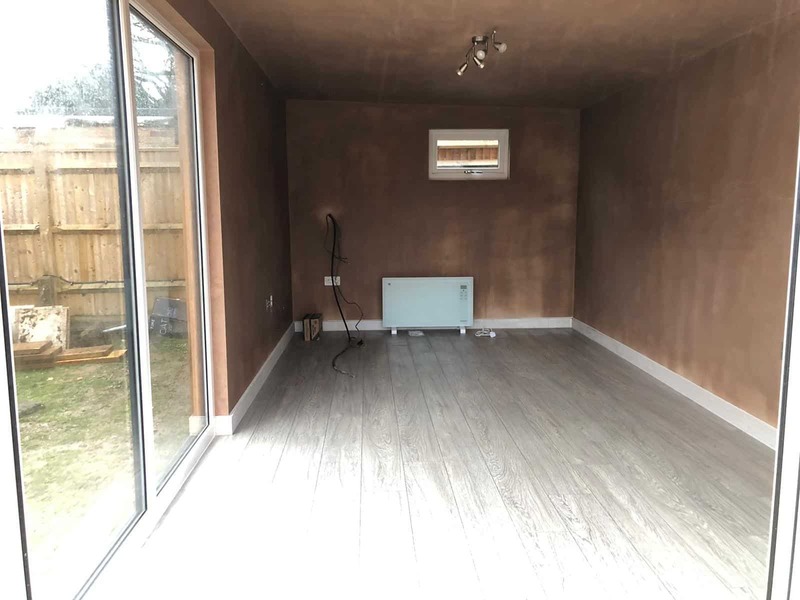 The whole room was insulated as standard like all Modern Garden Rooms builds, meaning it would certainly be a lot warmer for the children, as well as keeping their noise inside the building. 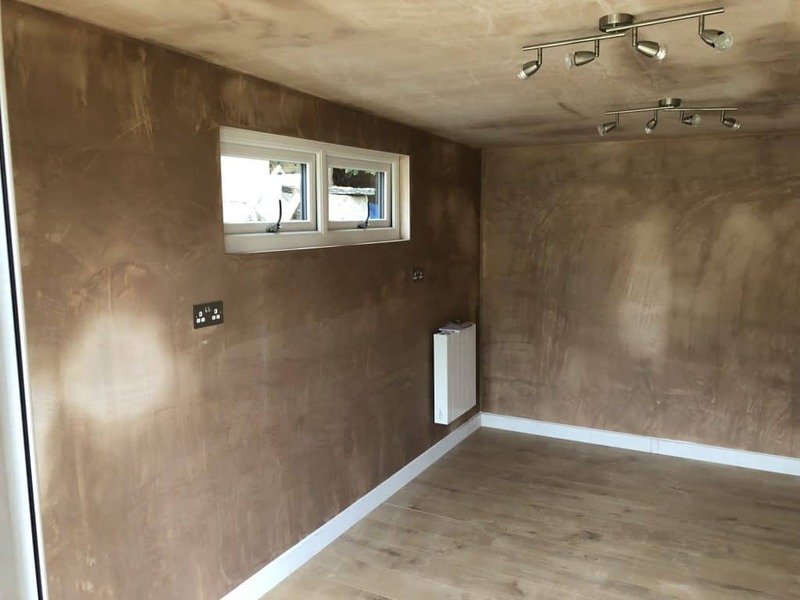 Inside, the room was plasterboarded and skimmed, ready for the nursery to paint and move straight into! We hope the children loved their new Garden Nursery. Andrew was looking to be able to work from home while still feel like he was “at the office”. But not have a structure that was too imposing in his garden. 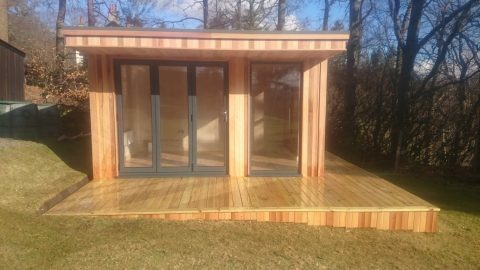 Was this beautiful cedar clad garden office, which has a reduced canopy and single step to reduce the impact of the building in his garden. 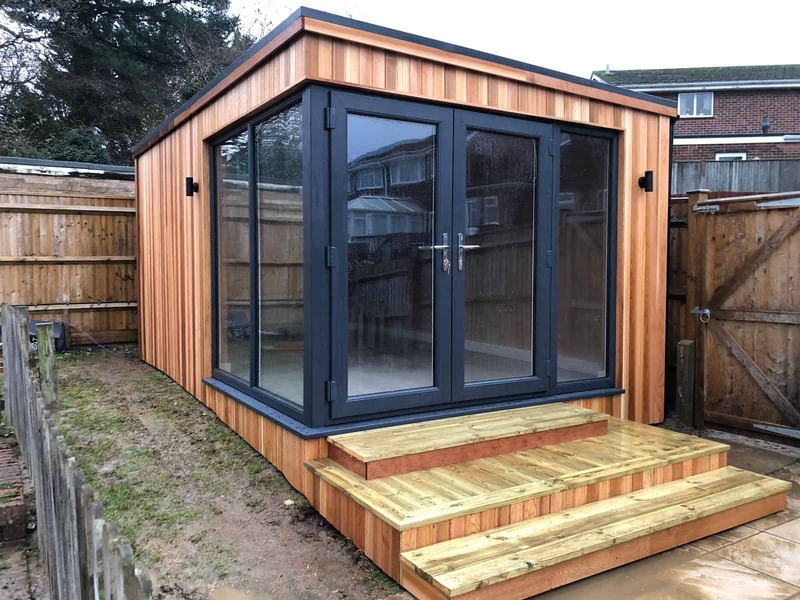 Andrew was looking for a company that could build him a garden room with storage. However he is on the Isle of Skye. Above all, he wanted a company that could cover everything from ground works to finishing details. 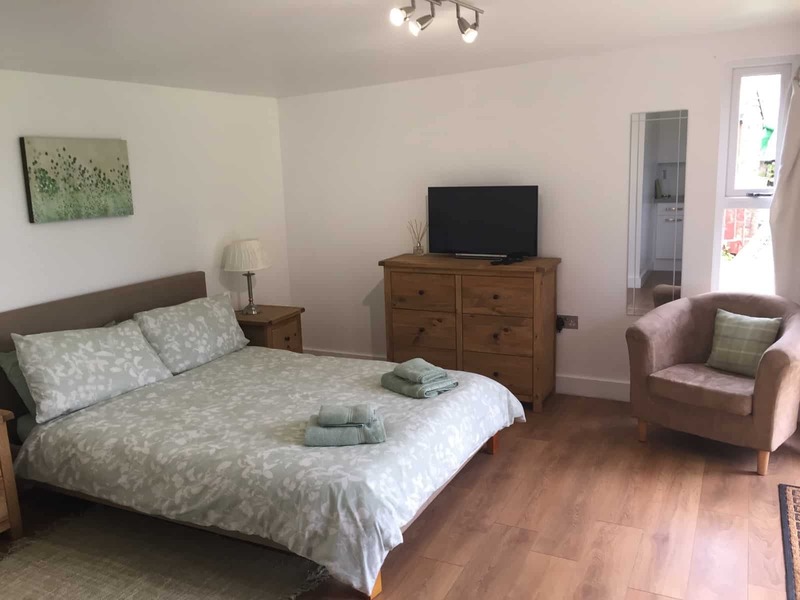 The room also needed to have a bedroom in the main room, a small room for a shower and toilet, and a storage shed accessible from the outside. 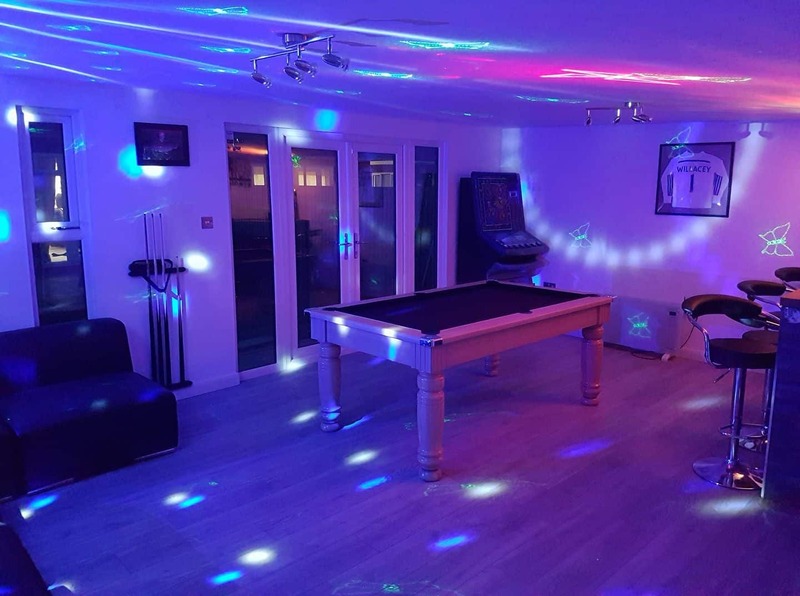 With the distance from our base in London been over 400 mile, a site survey wasn’t really an option, therefore it was great that we could work with Andrew through emails and pictures to design and plan his room to suit his visions and needs. 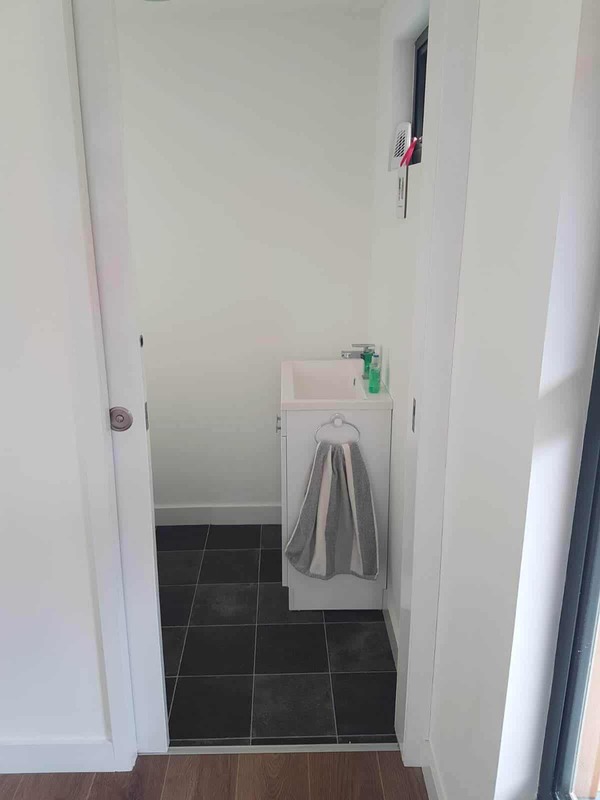 As a result our creative team came up with the following design which incorporates a bedroom, shower room and a storage “shed” . 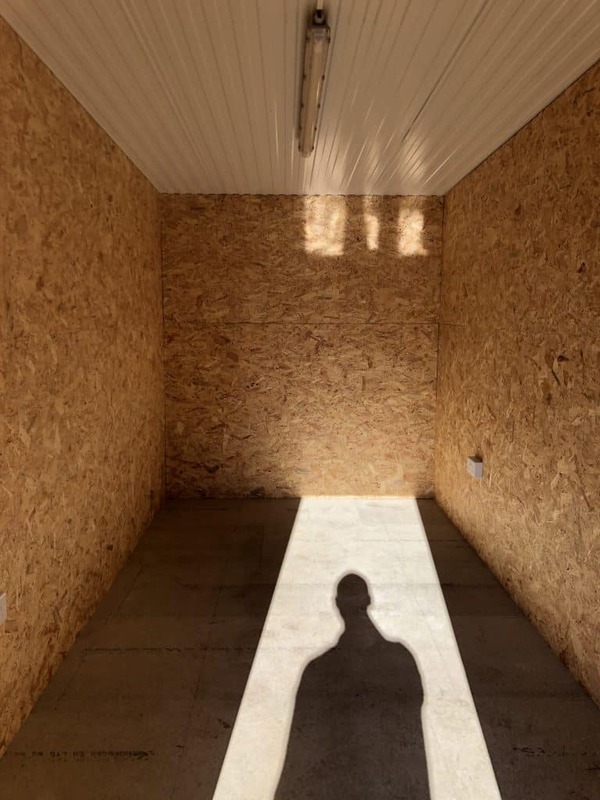 The storage shed can be accessed from the outside via a cedar cladded “secret door” – but has horizontal slats. This will break the design up and also to add an element of interest to the front of the building. We are really happy with how this design incorporates everything into such a small space.